Naviter is a small company in Slovenia which makes high quality soaring products that are extremely popular with sailplane pilots around the world. Their most popular products are listed below. 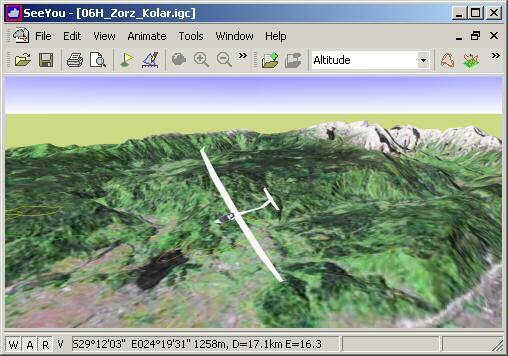 Popular and full-featured soaring flight software. The Oudie 2 is a Personal Gliding Assistant with built-in GPS and SeeYou Mobile and ConnectMe software pre-installed. The Oudie comes ready-to-fly with airports, airspace and maps for most of the world pre-installed. 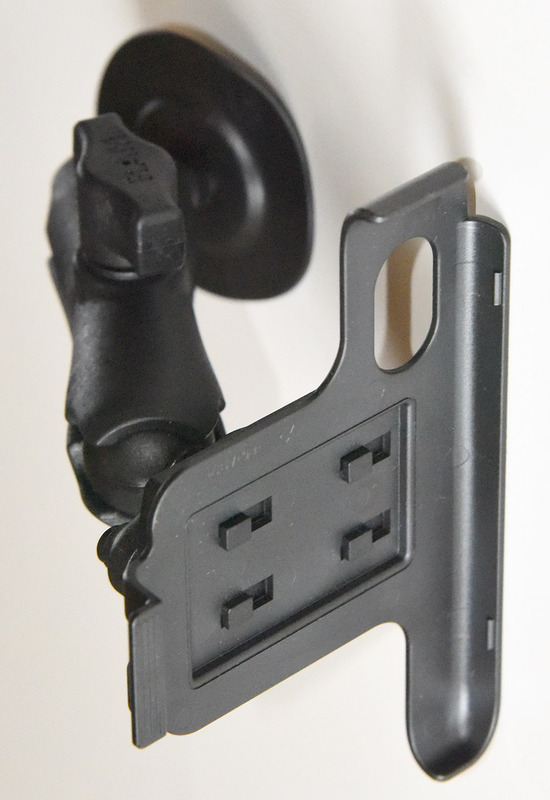 Also included are power/data cables, mounting cradle, wall charger, car charger - everything you need. 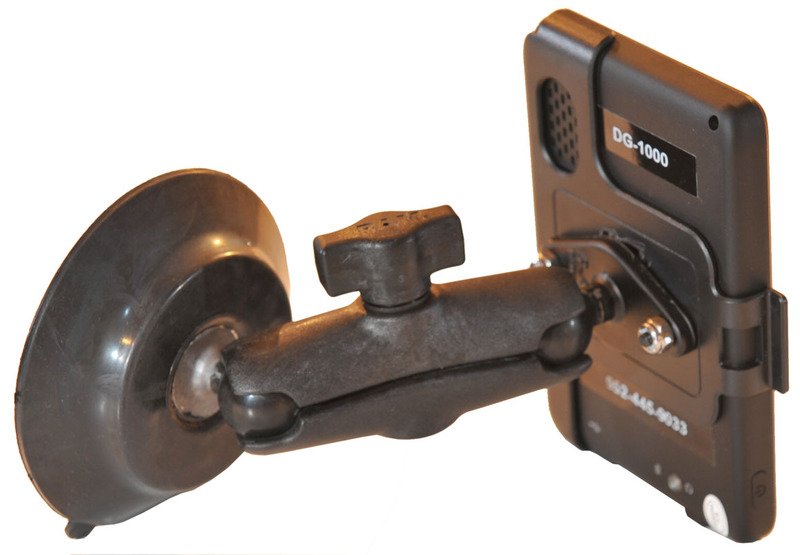 A great portable system with the Oudie, portable battery and glider canopy suction cup mount is shown below. The Oudie IGC has the same great screen and processor as the Oudie 2, but adds a 12 hour battery, aviation grade GPS, backup audio variometer, and IGC approved GPS flight recorder. 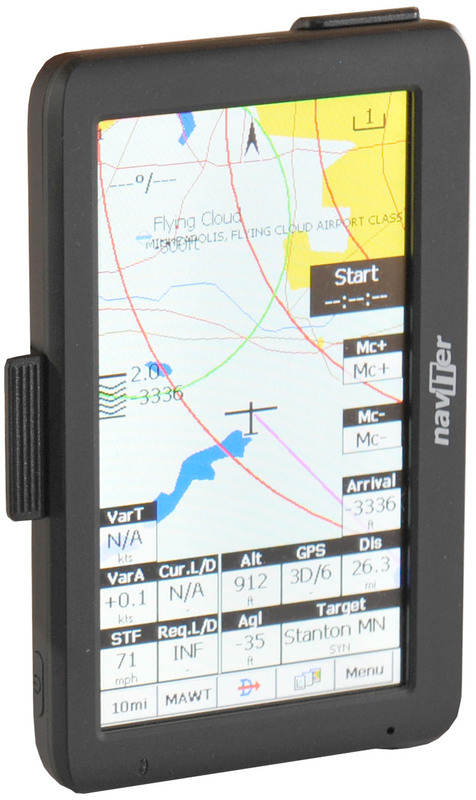 Many pilots are already flying with an Oudie connected to an LXNAV Nano. This great product has the components from a Nano inside the Oudie itself. It is perfect for use in club gliders and rental gliders. 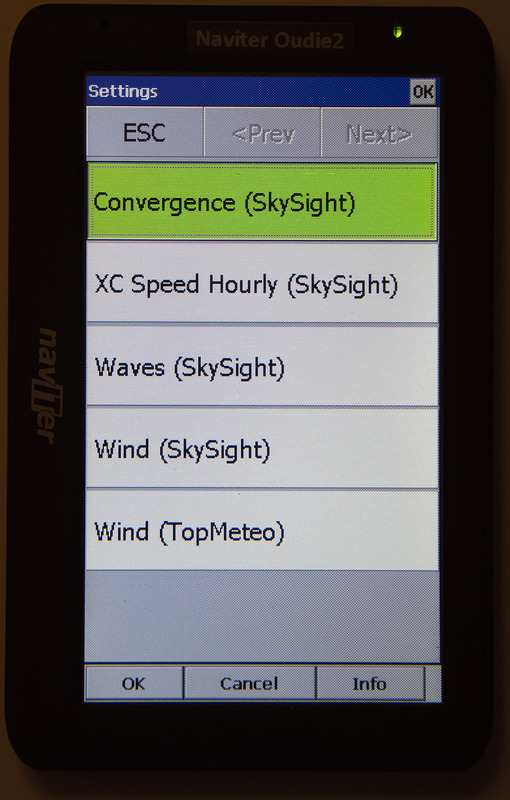 ConnectMe is a free utility for transferring data between a GPS Flight Recorder and a PDA or PNA. 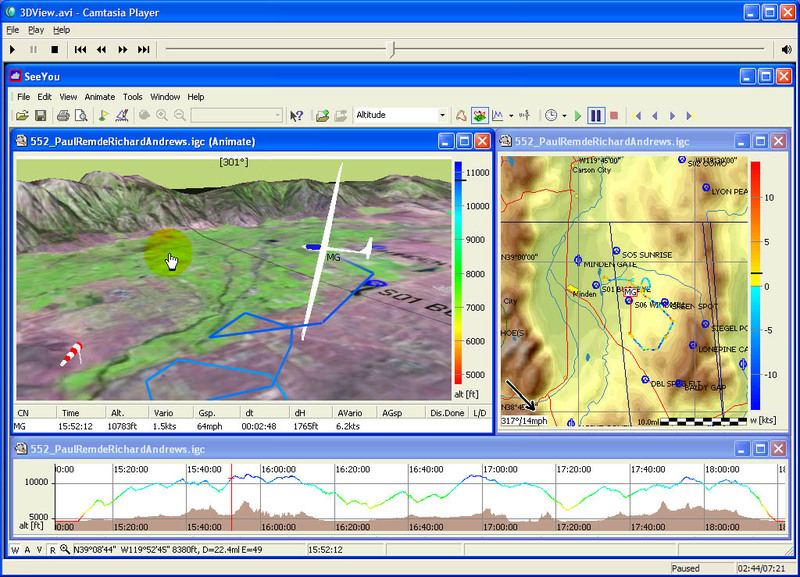 It can be used to download flight logs, and upload waypoint files and task declarations to many soaring flight recorders and flight computers. Naviter has done a fantastic job of making it easy to get high-resolution maps and weather forecast maps onto your Oudie. To get them you need a current SeeYou Subscription. You get a 1 year subscription when you purchase SeeYou or SeeYou-Upgrade. You also need to update your Oudie to the latest software version. The easiest way to do that is to use the free Naviter Updater. 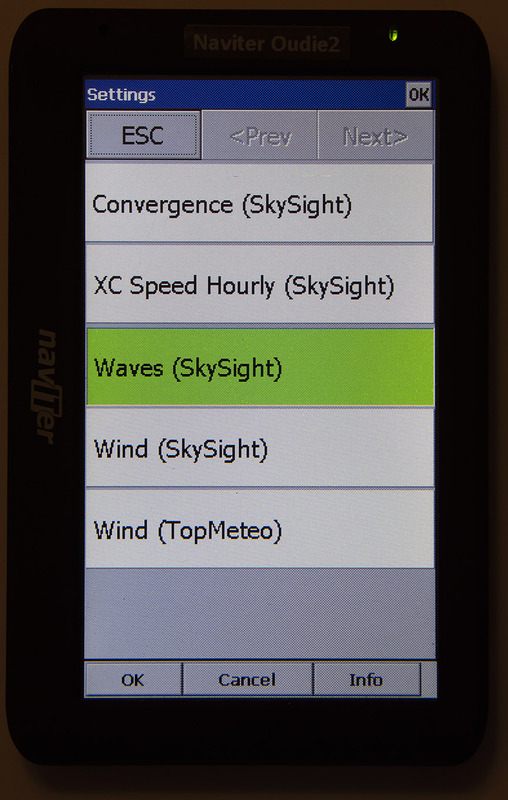 The Naviter Updater is also used to download, install, and enable the SeeYou Maps on the Oudie and to download and daily SkySight and TopMeteo wether forecast maps. It is done using a PC or Mac connected to the Oudie before you fly. 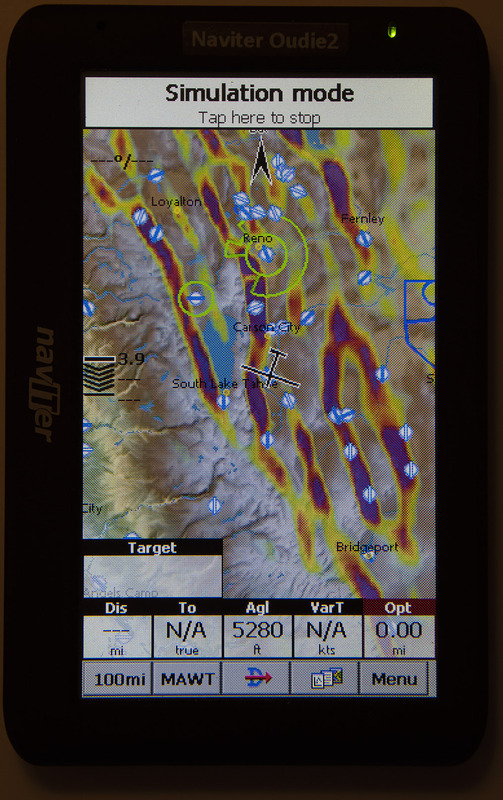 When flying in mountainous areas you'll find the Convergence and Waves maps extremely useful in flight. 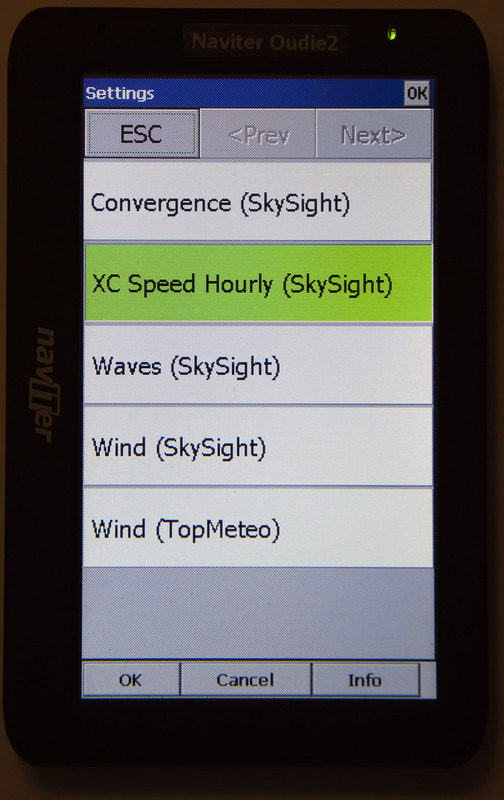 In flatland areas, the XC Speed Hourly maps allow you to easily fly to the areas where the lift is forecast to be the best for the day. These are amazing tools!!!! Click on the images above to view larger versions. The first 2 maps above show SkySight weather forecast maps coverage available for Oudie. The 3rd map shows TopMeteo coverage for Oudie. The weather forecast maps are not yet available for all regions, but most popular soaring regions are covered and more are coming soon. Trade-in your old Oudie or Oudie 2 for a new Oudie 2 for $375. Send your old Oudie (Oudie unit only - keep any accessories) to me and I'll transfer the Oudie Lifetime SeeYou Mobile license from the old Oudie to the Oudie 2. You pay $375 (plus shipping) for the Oudie 2 Lite and get a fully enabled Oudie 2 with all new accessories - making the system worth $625. It is possible to order the software registration keys directly from SeeYou. I ask that you please order it from me. I strive to help soaring pilots find and use the right products for their needs. I have created product comparisons like the Flight Software Comparison to help customers with those decisions. I also offer support to customers who buy through me. The best way to thank me for the services I offer is to help support my business by buying from me. Note: The prices on my web site should be the same or slightly lower than the prices on the SeeYou web site. If you look at the price in Euro on their site and use an online currency converter it will seem like their price is lower. However, if you start to place an order through the SeeYou web site you will see that the conversion rate to US$ is such that my price is the same or lower. If it is not close, please let me know. I will be competitive. The SeeYou and SeeYou Mobile software can be downloaded and tested using the link below. To enable the software you will need to buy a registration key. There are detailed manuals available for SeeYou and SeeYou Mobile and Oudie on the Naviter web site at www.naviter.com. I have created some "Tips" documents to help you get up to speed quickly with the SeeYou, SeeYou Mobile and the Oudie. These files are great for use in a Naviter Oudie or LXNAV Nano3, Nano4, LXNAV S8, S80, S10, S100, LX80x0 or LX90x0. 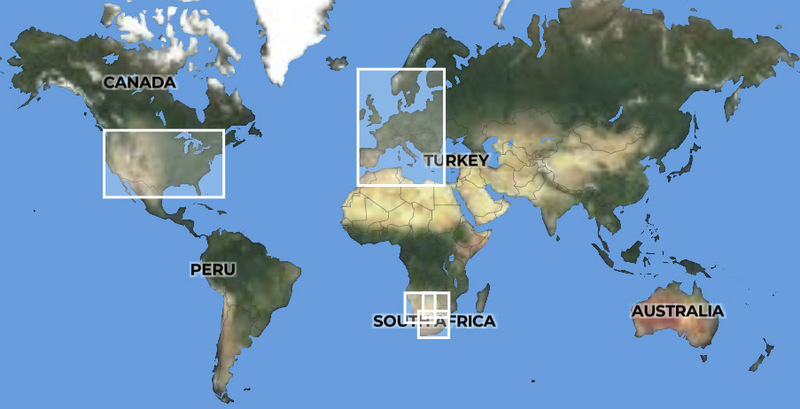 The waypoint file contains all public and private airports from an FAA database from here. 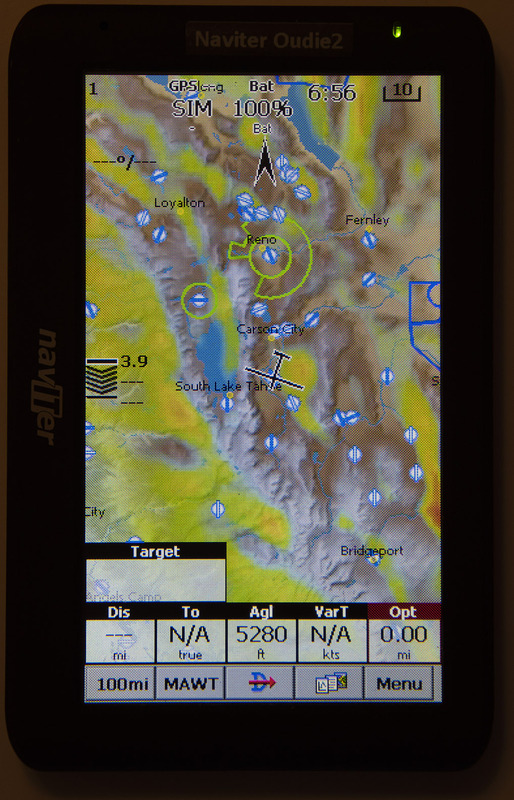 The airspace data is provided by Naviter. Right-click on the links and select "Save Target As" or "Save Link As" and save them into any directory on the desired soaring device. photos taken during the flight displayed during flight playback. The thermal assistant helps you move your circle to optimize your climb rate. 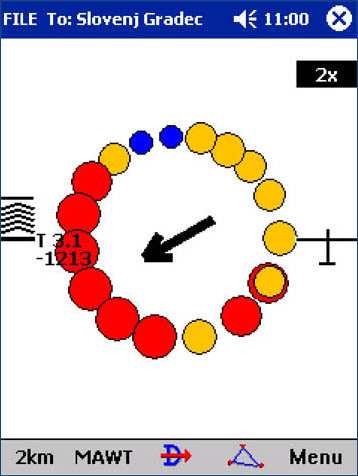 Larger circles indicate higher climb rates. The colors indicate whether the lift is stronger than the MacCready setting. The Arrow points to the best side of the circle. 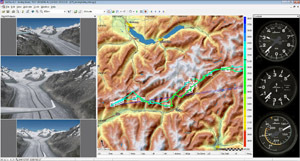 Moving map with tasks, waypoints, and user customizable data windows. Creating or modifying the task is simple with SeeYou Mobile. You can do it either at briefing before takeoff or in cockpit. Use the Menu > Task dialog. With the airspace getting smaller and smaller for glider pilots, keeping out of forbidden areas is imperative. 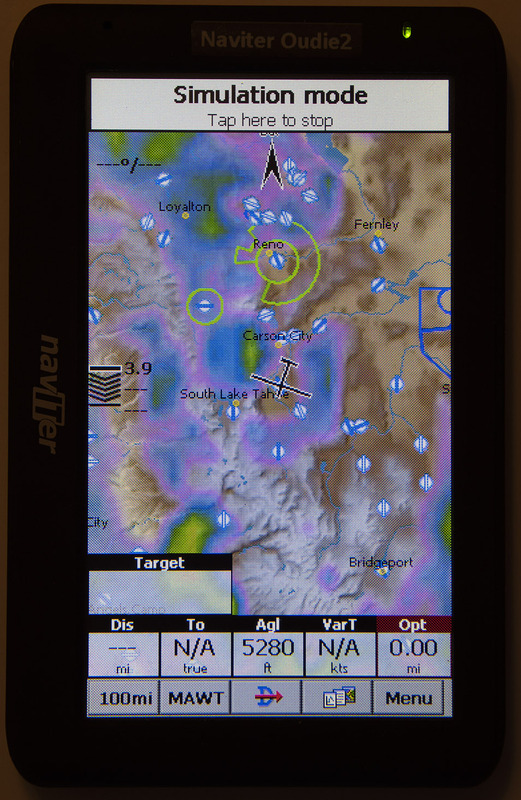 SeeYou Mobile offers you touch-screen, visual and audio control about the airspace in your vicinity. 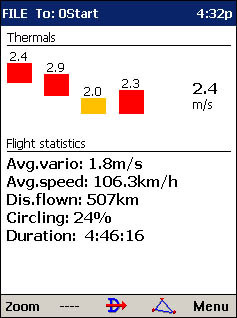 In-flight statistics like the thermal histogram shown above help you make good in-flight decisions. FLARM traffic can be displayed on the moving map screen. 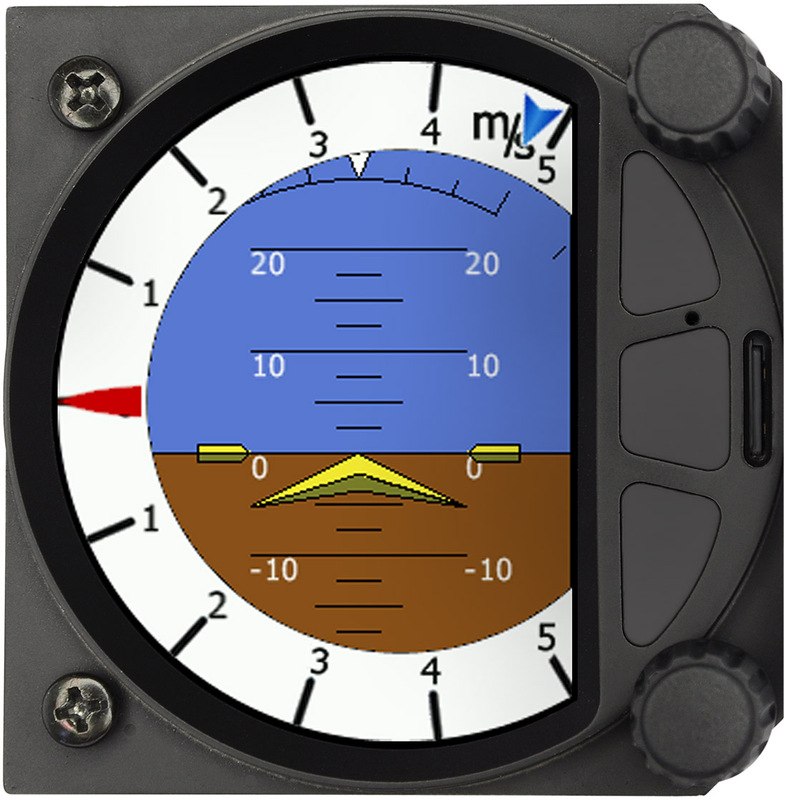 Their altitude and climb/sink rate is also displayed. If the traffic's FLARM ID has been registered (it's free) at www.flarmnet.org, and the latest FLARMNET file has been saved on the PDA, then their contest ID or name will be displayed next to their glider on the moving map. 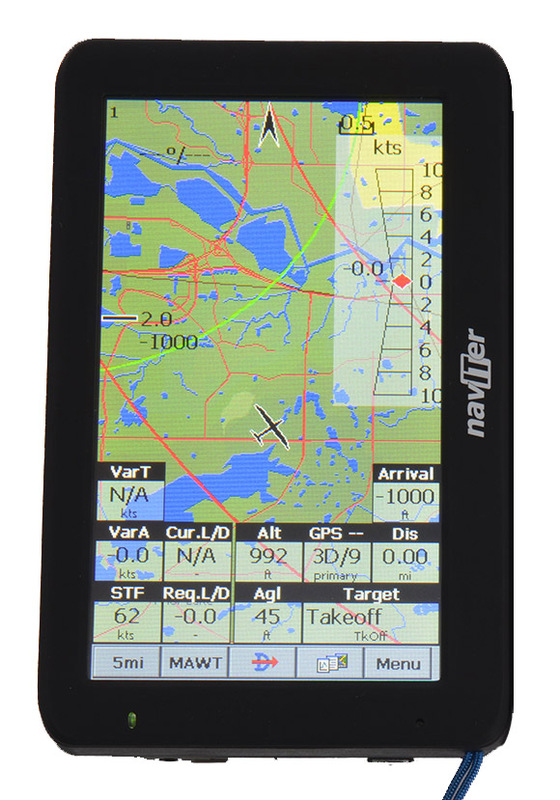 Screen Size 2.48" x 4.37"
(63 mm x 111 mm) 2.48" x 4.37"
This is a great portable system that can log flights for the OLC (Online Contest) and is fully IGC approved for all badges and records and soaring contests. 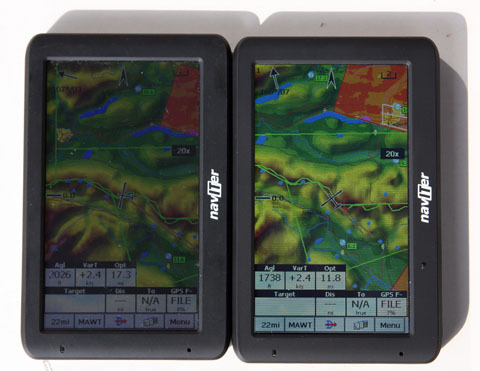 The Oudie IGC has a built-in aviation grade GPS and comes with SeeYou Mobile soaring flight software. 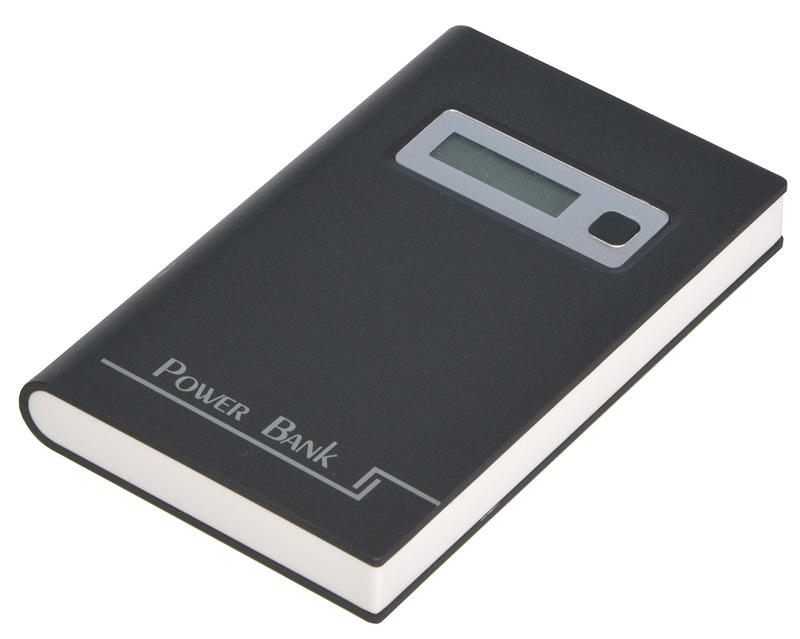 The Oudie IGC's built-in battery can power it for over 12 hours. The Oudie IGC also has a built-in variometer (not Total Energy compensated) which works great as long as you keep the airspeed relatively constant. This system does everything that was previously done with an Oudie 2, 5V external battery and LXNAV Nano flight recorder. 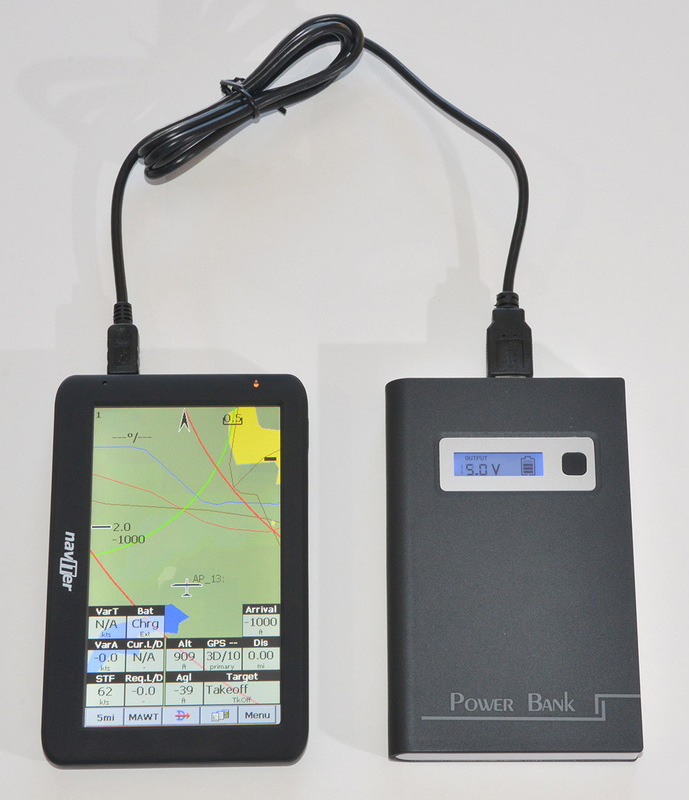 This is a great portable system that can log flights for the OLC (Online Contest). The Oudie has a built-in GPS and comes with SeeYou Mobile soaring flight software. The 5V Battery Pack can power the Oudie for over 14 hours. The Oudie can log flights which are accepted by the OLC (Online Contest). However, the Oudie's "PDA Logger" is not approved by the IGC and therefore can't be used for badges or records. The new sunlight readable version of the Oudie is easy to read even in bright sunlight. is included in the box with the Oudie. This is a fantastic complete flight computer system. The Oudie IGC provides GPS data to the S8 or S80 variometer. 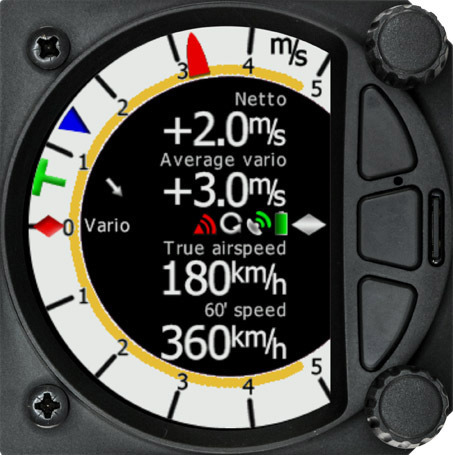 The S8 or S80 adds vario, airspeed and wind data and sends it all to the Oudie IGC. The S8 or S80 powers the Oudie IGC with 5V. 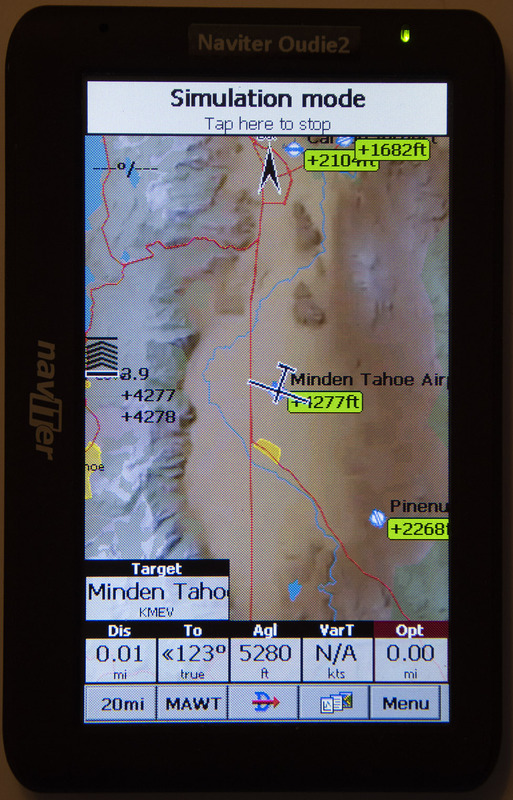 Ths S8 or S80 can display waypoints and airspace and tasks for navigation. The Oudie IGC has a built-in battery good for 12 hours - so you can take it with you when flying club or rental gliders. 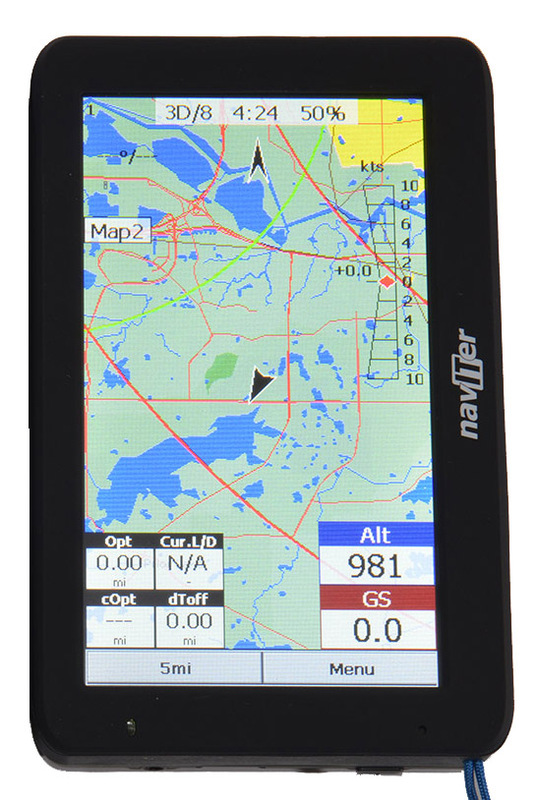 The Oudie IGC is a very bright color navigation display with detailed maps and final glide calculations - and a built-in IGC approved GPS flight recorder. The S8 or S80 powers the Oudie2 with 5V. 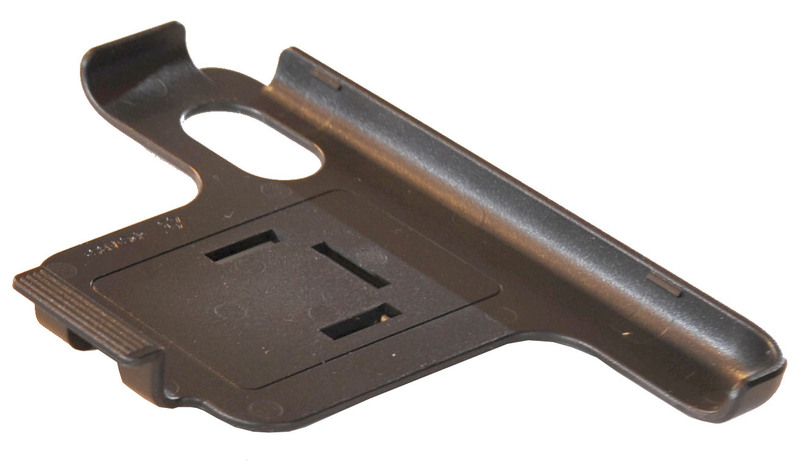 Other mounting options include the Oudie-Mount-RAM-SCM or a Oudie-Mount-GNeck-Panel or Oudie-Mount-GNeck-RA. This is a fantastic complete flight computer system. 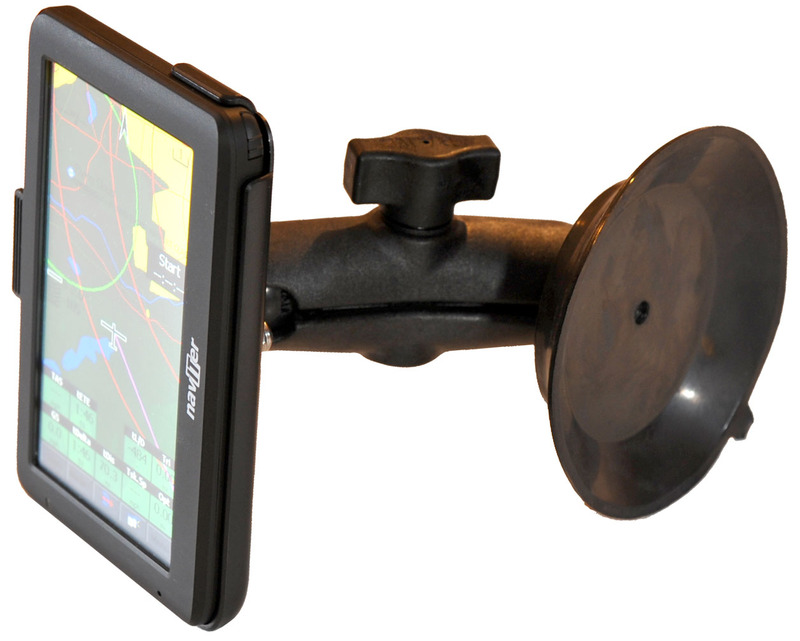 The PowerFLARM provides GPS and FLARM traffic data to the S8 or S80 variometer. 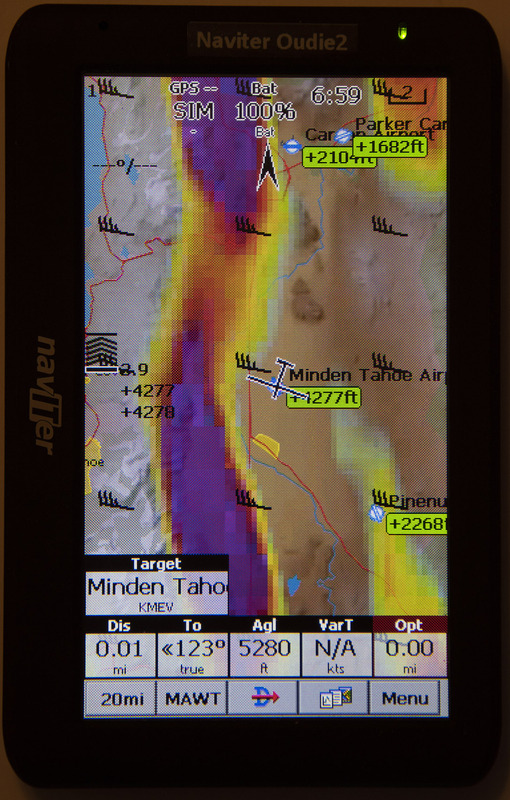 The S8 or S80 can display FLARM traffic, waypoints, tasks and final glide calculations. 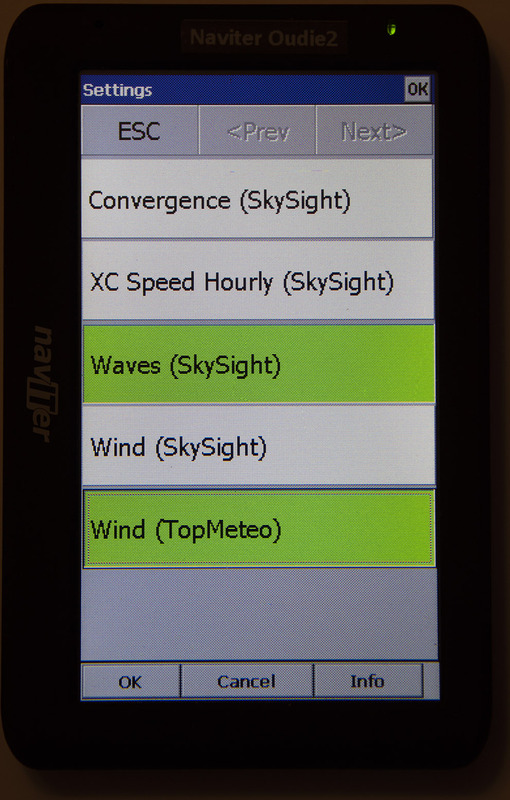 The S8 or S80 adds vario, airspeed and wind data to the FLARM and GPS data and sends it all to the Oudie2. The SeeYou Mobile software on the Oudie can send an official task declaration through the S8 or S80 to the PowerFLARM Core. The S8 or S80 powers the Oudie with 5V and the PowerFLARM Core with 12V. 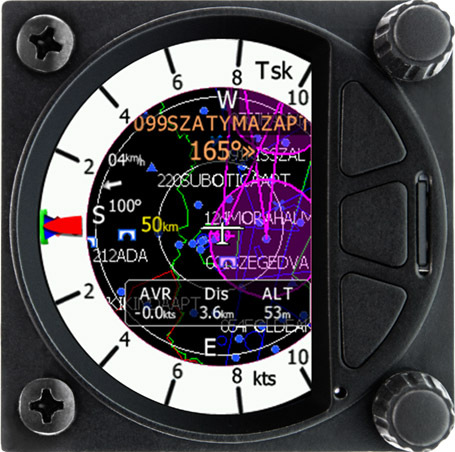 The Oudie2 is a very bright color navigation display with detailed maps and final glide calculations. Since the products below are from Slovenia, the prices are subject to change with fluctuations in exchange rates. I keep the prices on this web page lower than purchasing directly from SeeYou. The Oudie 2 Lite has the same hardware and bright display as an Oudie 2 and has SeeYou Mobile software pre-installed, but does not include a license for SeeYou Mobile. Oudie 2 Lite owners can use their existing PDA or PNA SeeYou Mobile license, or install free soaring flight software such as XCSoar, or they can purchase a license for SeeYou Mobile in the future - with free upgrades for the life of the Oudie 2 unit. 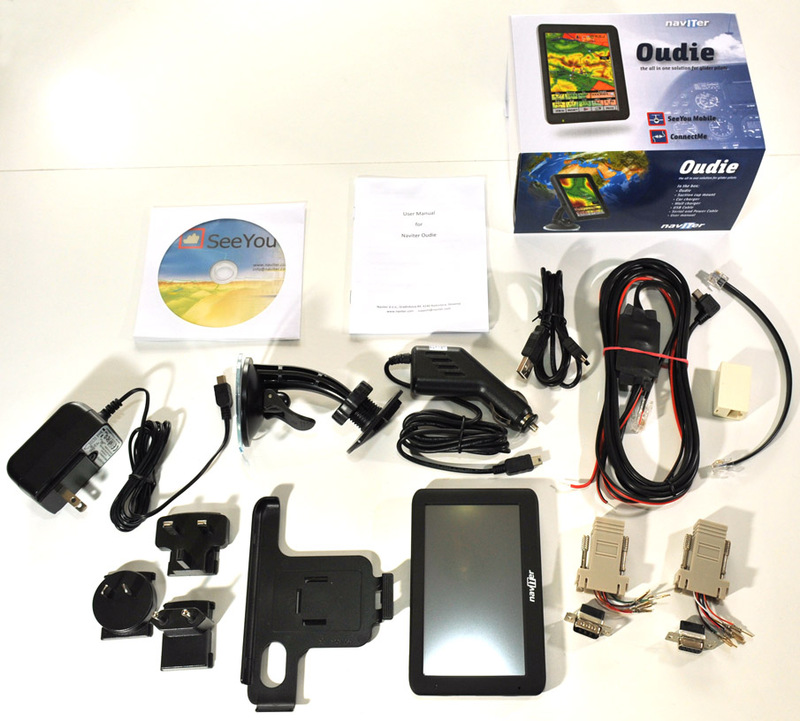 The Oudie 2 and Oudie 2 Lite units are a delivered with an extensive set of accessories (see below) - including a power/data cable and adapters for connection to most any soaring instrument, mounting cradle, suction cup mount, car charger, wall charger, and PC USB cable. The extremely bright display and included accessories make the Oudie 2 and Oudie 2 Lite exceptional values. The Oudie 2 (below) is still available with the Oudie Lifetime License for SeeYou Mobile for sailplanes with free software upgrades for the life of the unit. All new Oudie 2 and Oudie 2 Lite units shipped after September 2012 have the following advantages over earlier Oudie and Oudie 2 units. Since the Oudie 2 Lite units were introduced in December or 2012, all Oudie 2 Lite units have these new features. Note: See also the Naviter-Oudie2-Bundle below. It includes the Oudie with brighter screen and SeeYou for the PC. You save $35 when you order them together. The original Oudie was a revelation when it was first released. It offered a very nicely packaged combination of PNA, GPS and soaring flight software - complete with cables, chargers, mounting cradle, etc. When released it was slightly brighter than any existing PDA or PNA. Even so, like all color PDAs and PNAs at the time, it was only "OK" in sunlight. Turning off the display of terrain data made it acceptable, but not great in bright sunlight. In every other respect it was (in my opinion) the perfect "Personal Gliding Assistant". The Oudie proved to be a huge success. I sold over 400 of them over 2 years. They would not have been so popular if pilots didn't agree that they were acceptable in sunlight. Yet we all wished for a much brighter screen. The only bright alternatives were much more expensive large displays that needed to be mounted in the instrument panel (requiring the re-layout of the instrument panel). The great news is that Naviter has now introduced a new, brighter version of the Oudie. How much brighter is it? You can see for yourself in the photos above. Click on them to view larger versions. They were taken in bright sunlight. The original Oudie is on the left and the new Oudie is on the right in each photo. 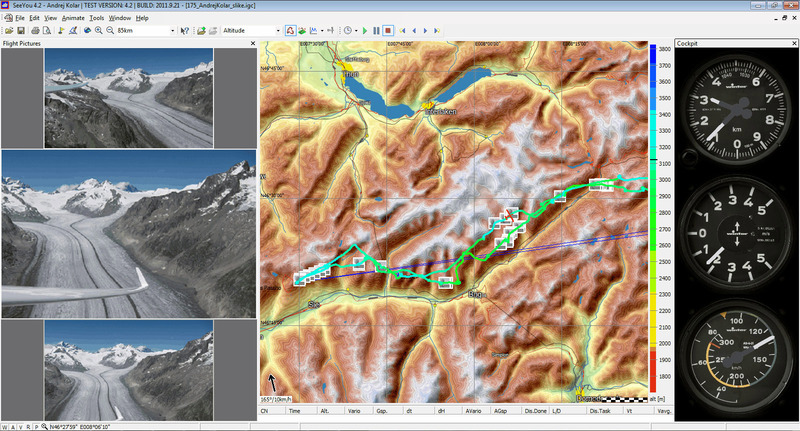 The display of terrain data is turned off in the left image. The brightness of the new Oudie is in the 900 to 950 nits range. That is very bright. The original version Oudie had a brightness in the 350 to 400 nits range. The Oudie is now the perfect soaring tool. The Oudie is a "Personal Gliding Assistant" that is nearly perfect for use in gliders. Many current model PDAs and PNAs suffer from some "gotcha" issue such as the lack of a serial port, or low resolution, screen too small or too large, etc. The Oudie is the perfect size for use in a glider and offers a built-in GPS and built-in RS-232 serial port - so it can talk to soaring flight computers and flight recorders. 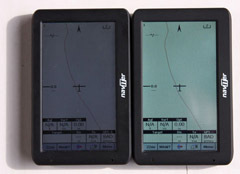 The 5" diagonal screen is a little larger than a PDA, but the overall footprint is much smaller than the existing "high end" soaring navigation displays. The screen resolution is 480 x 272 pixels. That is more than an iPAQ h3900, the same as the Bendix King AV8OR and less than iPAQ 310, iPAQ hx4700 or ClearNav. 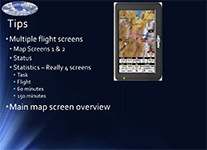 I have flown many hours with an Oudie I have been very satisfied with its screen resolution. The price is very reasonable considering it includes a built-in GPS, suction cup mount, power/data cable with built-in 12V to 5V power converter and a license for SeeYou Mobile that is tied to the Oudie. 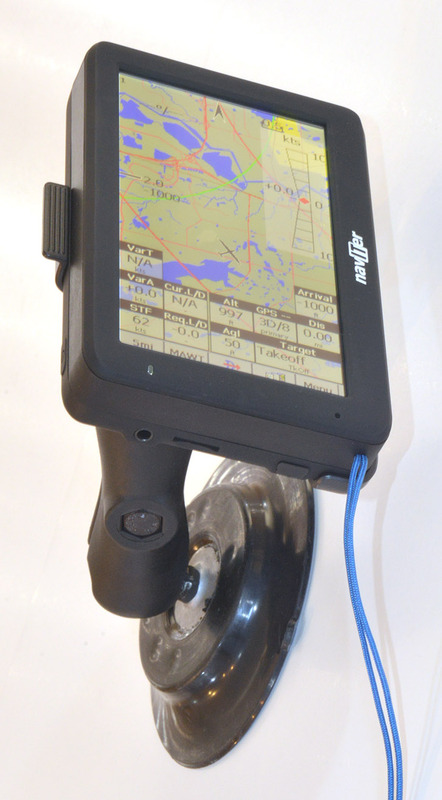 The Oudie (with its built-in GPS) has been popular both for pilots looking for a portable system in club and rental gliders, and pilots looking for a semi-portable mounted system wired into a glider's electrical system and connected to a soaring GPS or flight computer. One major advantage that the Oudie has over all other PDAs/PNAs is that it has non-volatile memory. It does not lose any data when the battery dies. You just re-charge the battery and go fly. Another cool feature is that when using an external GPS, the Oudie will automatically switch from external GPS input to using its internal GPS in the event that the external GPS stops sending data. It also automatically switches back to the external GPS when it starts receiving data from it again. I am often asked how to pronounce "Oudie". I don't have an exact answer. At first I suspected OwDee (as in the way "ou" is pronounced in the words "out" and "loud"). But now I suspect it is OhDee (as in O.D.). My theory is that Oudie it is a play on words just like the name of their PC software - SeeYou. SeeYou could be a play on the abbreviation C.U. (or Cu) (get it... CU = SeeYou) often used as a shorthand way to say Cumulus. Likewise Oudie just may be a play on the abbreviation O.D. (over development - what happens when there is too much moisture in the air and strong lift such that the clouds grow too big and cover too much of the sky). What do you think? Am I right, or is it just late and am I "reaching" a bit...? Regardless of how you pronounce it, it is a great product and a huge hit with soaring pilots around the world! It is a "Personal Gliding Assistant" which runs SeeYou Mobile natively. What makes it different than any other device on the market is the ability to perform all of the most important tasks for glider pilots right out of the box. Automatic GPS input switching - When receiving data from an external device, if the Oudie stops receiving data from that device it automatically switches over to using its internal GPS. It also automatically switches back to the external data source when it starts working again. 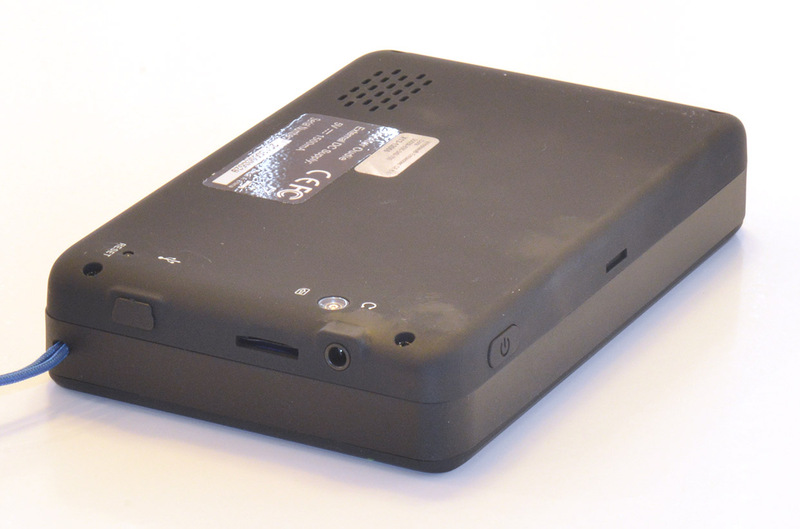 GPS Data Output - The Oudie can be configured to send GPS data out to another device. 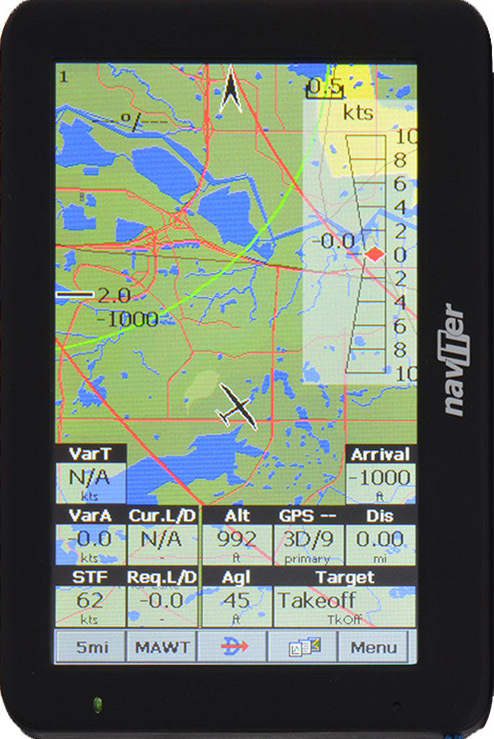 For example, the Oudie can send GPS data and "distance to target" data to a Cambridge L-NAV or S-NAV. For details see the required cable here: Cable-Oudie-LNav-0p3. It can also send GPS data to an LXNAV S7 variometer. Oudie Cable Kit- It connects to the unit's mini-USB connector and includes a built-in 12V to 5V power converter and an RS-232 voltage level converter. 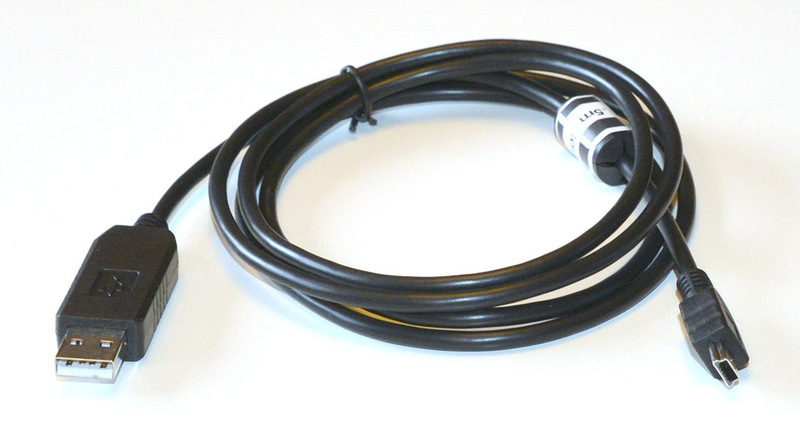 This supplied Oudie cable can be connected directly to a FLARM or PowerFLARM unit. RJ45 (female) to DB-9f and DB-9m adapters are included which can be configured for connection to most soaring GPS and flight computer types. Airport and Airspace files for much of the world are pre-installed. Below is a list of the included files. To select the airport and airspace files for your region, in SeeYou Mobile, go to Menu > Settings > Files. It is also easy to generate airport and airspace files for your area using the Mobile Wizard in SeeYou on the PC. The Mobile Wizard is shown in my SeeYou Training video number 46 here. USA (divided into files for "USA West", "USA Central" and "USA East"
I can provide airport and airspace files for other countries or regions upon request. I charge $20 for that service. Battery Duration with backlight at full brightness: about 2 hours, 45 minutes - However, the unit has a light sensor and can dim the backlight when inside (such as in the hanger) - which will extend the battery life quite a lot. The Oudie comes with a complete set of accessories. The SeeYou Mobile software license includes free upgrades to the SeeYou mobile software for the life of the Oudie unit. 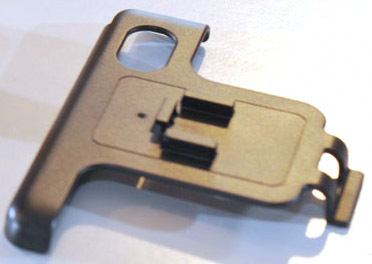 The license key is tied to the serial number of the Oudie and can be sold with the Oudie. Actually more of a short "Getting Started" manual. A full Oudie 2 manual is available on the Naviter web site at www.naviter.com - then go to the Products menu and select Oudie 2. Contains installation programs for SeeYou for PC, SeeYou Mobile and ConnectMe. Note: A license for SeeYou for PC is not included with the Oudie. If you do not already own a license for SeeYou for PC, I highly recommend buying the Naviter-Oudie2-Bundle. You save $35 when you order them together in the bundle. 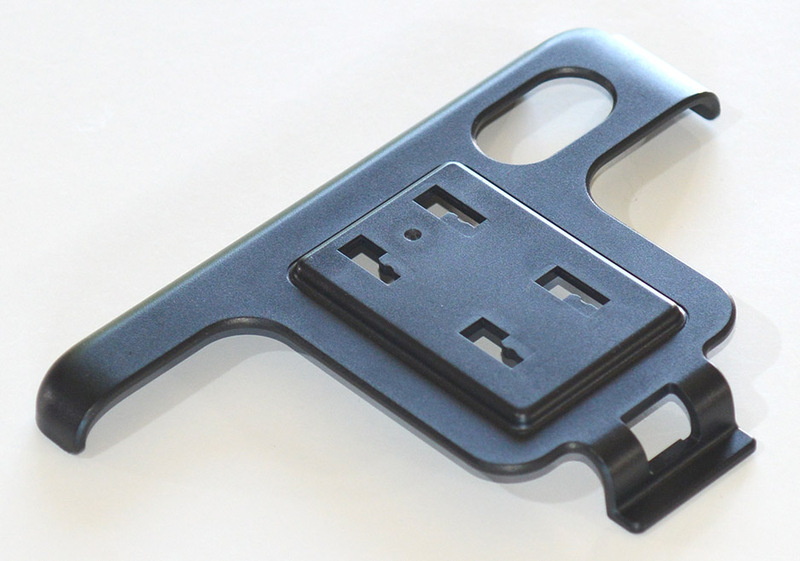 For connecting the Oudie to a PC or Socket Mobile Power Pack, This is a standard USB to mini-USB cable. If you lose it you can buy another at Radio Shack or Best Buy or Target, etc. 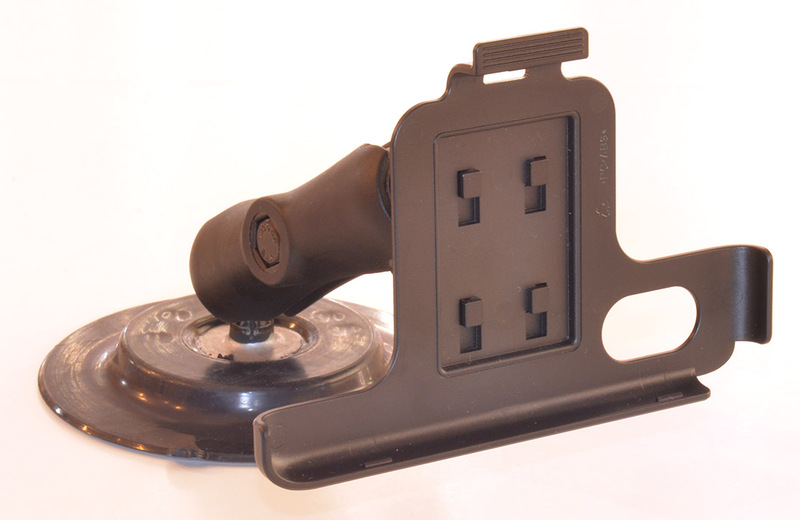 With 4 exchangeable plugs (for use in different countries) - supplies 5V power to the Oudie. male cigarette lighter plug to mini-USB connector, includes a 12V to 5V voltage reducer and provides 5V power to the Oudie. 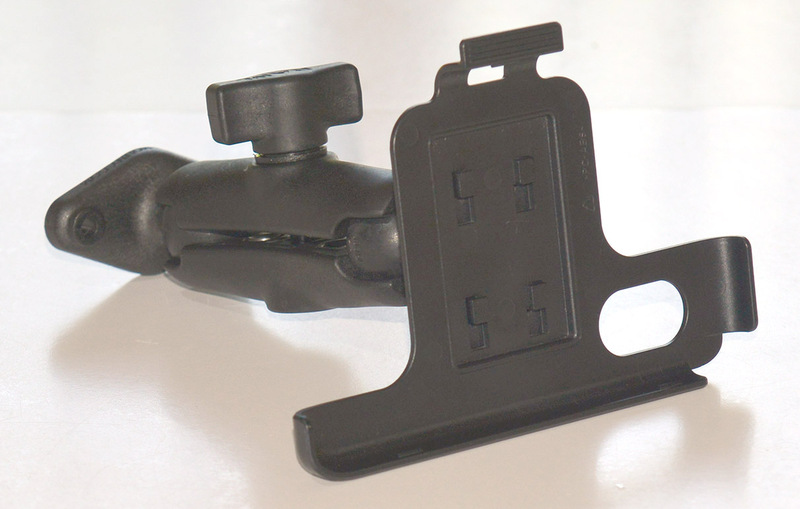 Simple plastic cradle for use with supplied suction cup mount. 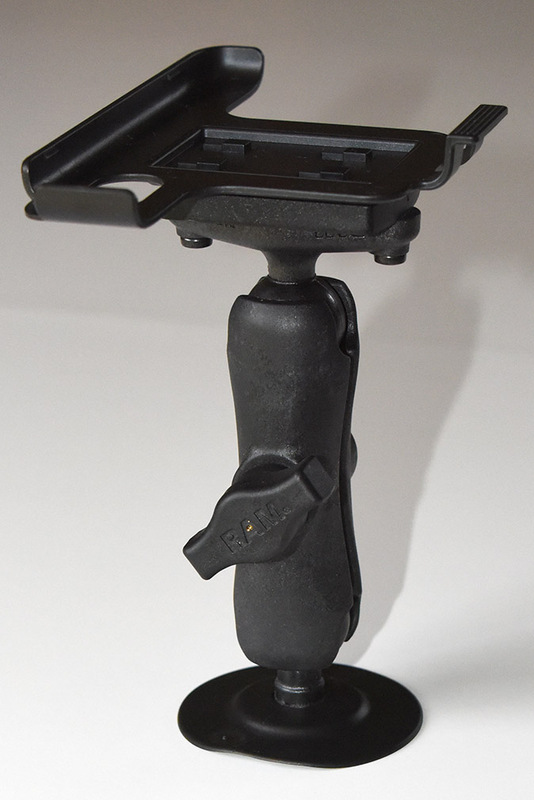 The cradle works great with a RAM arm or gooseneck arms using the optional Richter-Cradle-Adapter. Extra cradles are available for $5. I have them in stock. This is designed for use on a glass window in a car. Since it has a mechanism for pulling a strong suction it may or may not be ideal for use on an expensive and flexible glider canopy. I don't recommend using similar devices in gliders because they "dimple" the canopy when in use and may cause crazing over time. I recommend using the Oudie's cradle with the Richter-Cradle-Adapter and a RAM arm or GNeck2 gooseneck or RAM suction cup mount. 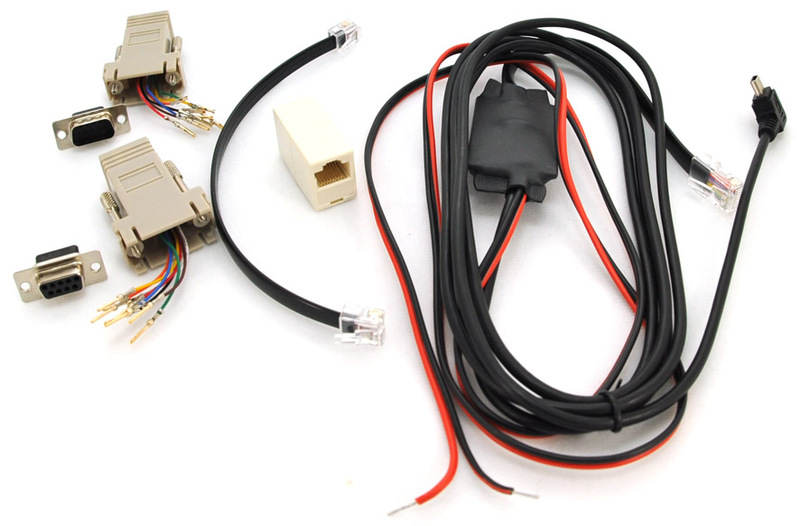 Includes: 12 V power leads, mini-USB connector for Oudie, and RJ45 connector. The RJ45 connector can be connected directly to a FLARM or PowerFLARM unit or Volkslogger. This cable will provide the 12V power to the FLARM, PowerFLARM or Volkslogger. The pins connections are to the "IGC Standard". 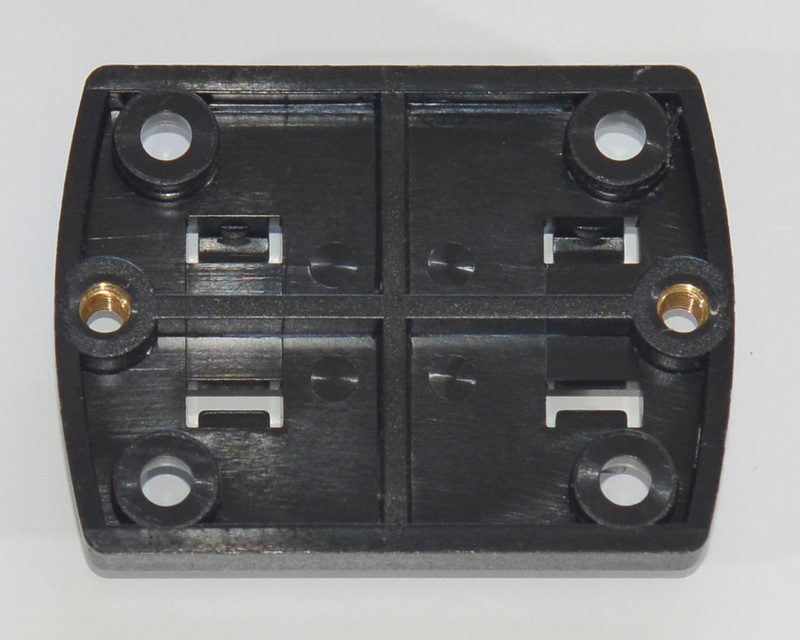 This is a configurable adapter that can be used to connect the Oudie Power/data cable to a variety of soaring instruments. Simply push the pins into the receptacles on the DB-9m connector and snap the connector into the housing. 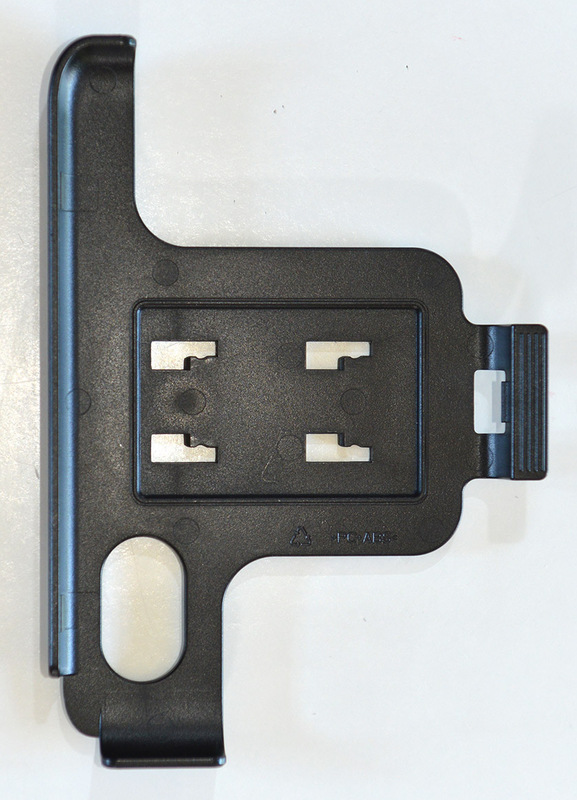 This is a configurable adapter that can be used to connect the Oudie Power/data cable to a variety of soaring instruments. Simply push the pins into the receptacles on the DB-9f connector and snap the connector into the housing. 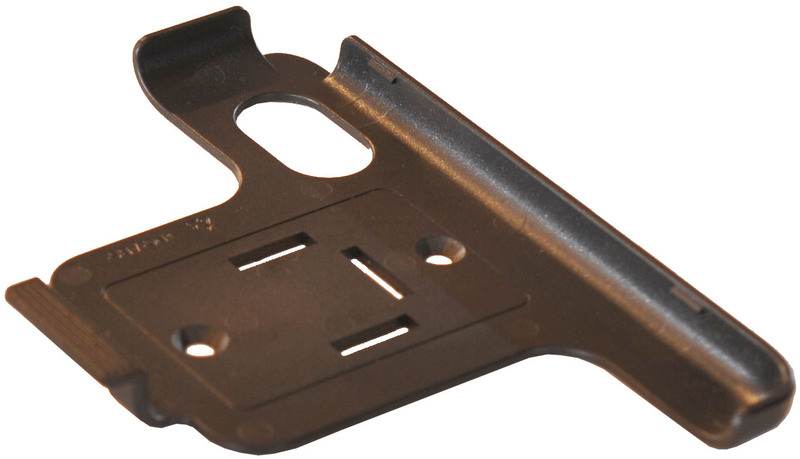 Richter-Cradle-Adapter - Adapter for connecting the Oudie cradle to a RAM diamond base or RAM-GN3-238 gooseneck adapter. 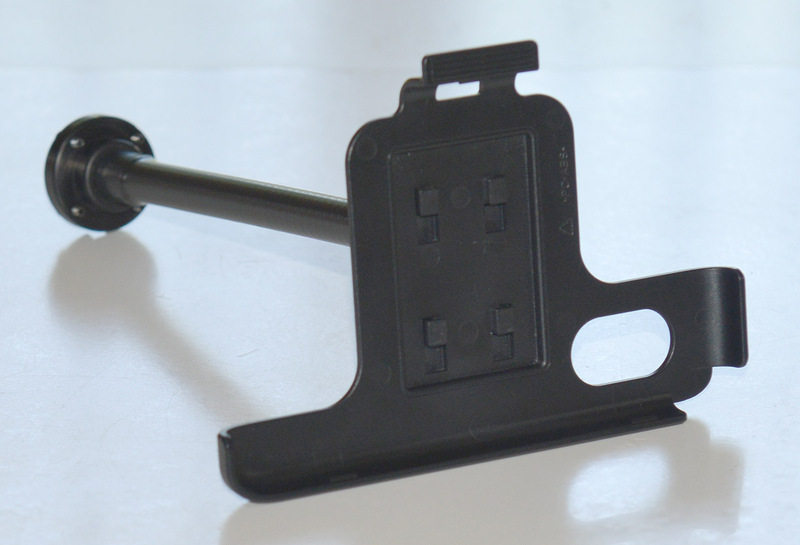 It is used in each of the mounting kits below. 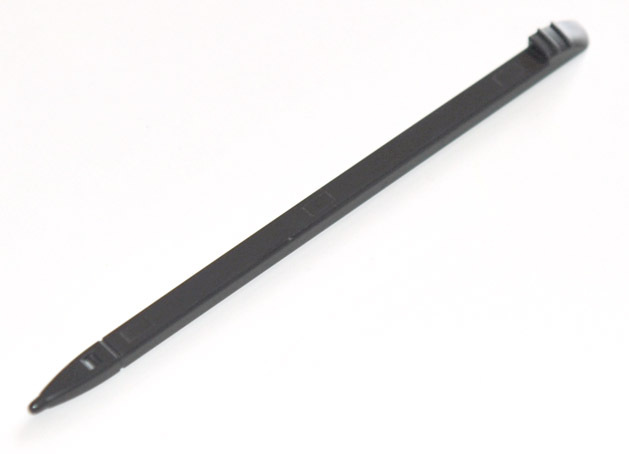 Goddard: Condor-Oudie-1p5 - Goddard cable for connecting an Oudie or Oudie 2 (not Oudie IGC) to a PC for use with Condor soaring flight simulator. Memory Expansion: microSD card, It accepts either standard or high-density (greater than 2 GB) cards . It also has 4 GB or internal memory (of which 2GB will be used by pre-installed world wide vector maps). The remaining memory can be used to store waypoint and airspace files. The Oudie looks like a USB Flash Drive when connected to a PC using a standard USB cable. Therefore, the Mobile Wizard (in SeeYou on the PC) can be used to send waypoint and airspace files directly to the Oudie memory. With Oudie there will be no more empty batteries, lost data, re-installations and re-registrations. All the data is kept in flash memory so even if the battery goes dead all you have to do is refill the battery and everything is there. No setup, no installation, nothing. Since it comes with SeeYou Mobile and worldwide Vector Maps installed, initial setup is greatly reduced. You still need to transfer waypoint and airspace files to the device through the microSD card, or to the internal memory using a USB cable, but that is about it. Question: Is a microSD memory card required? Answer: The Oudie has a microSD slot, but does not include a microSD card. A customer supplied microSD card may be used to transfer flight logs from the Oudie to your PC and to transfer waypoint and airspace files from the PC to the Oudie. However, and SD card is not necessarily required because you can also transfer data by connecting the Oudie to a PC using a standard USB cable. There is plenty of memory (about 2 GB) in the Oudie which can be used for storing waypoint and airspace files and flight logs. When you connect the Oudie to the PC the Oudie looks like a USB Flash Drive. You can then use Windows File Explorer to transfer the files between the PC and Oudie. However, some pilots (especially pilots in a syndicate in which many pilots use the glider and Oudie) may want to use a microSD card to transfer flight logs home and leave the Oudie at the gliderport. Question: Can I run WinPilot or pocket*StrePla or Glide Navigator II on the Oudie? Answer: No. Those software products have not been upgraded to run on devices like this one. I imagine that the internal battery will power the unit for only an hour or 2. Therefore it will probably be necessary to power the unit either with an external portable battery such as the Battery-5V-8000mAh-w-charger or Battery-5V-11200mAh-w-charger, or to power it with 12V using its supplied Oudie power/data cable. The Oudie works great with the Battery-5V-8000mAh-w-charger or Battery-5V-11200mAh-w-charger and a standard USB to mini-USB cable (included with the Oudie) can be used to connect them together. The Battery-5V-8000mAh-w-charger powers the Oudie 2 for 14 hours and the Battery-5V-11200mAh-w-charger powers the Oudie 2 for 18 hours. The Oudie is supplied with an Oudie Cable Kit with a built-in 12V to 5V power converter and an RS-232 voltage level converter. 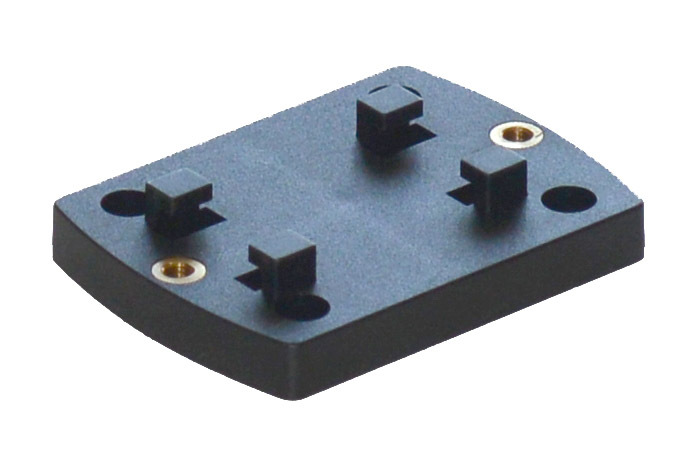 It will work great for connection to 12V power but the built-in 12V to 5V connector is not required for connection to a Cambridge 302 or LX1600 or LX7007 or Goddard PS-5a power converter - since those products can supply the required 5V power for the Oudie. Therefore, the cables below are recommended for use with a Cambridge 302, IMI Erixx, LX1600, LX7007 or Goddard PS-5a power converter. Oudie-EWmicroRec-0.3 - Important Note: If you connect the Oudie power/data cable's RJ45 connector directly to an EW microRecorder, it will probably kill the EW microRecorder. It is important that you use this adapter cable. 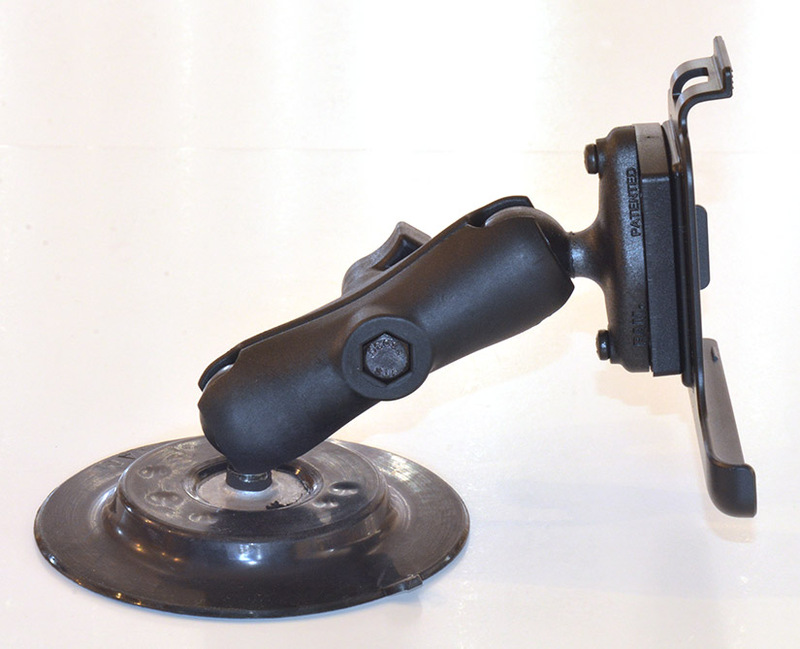 The unit includes a suction cup mount designed for use on a glass window in a car. Since it has a mechanism for pulling a strong suction it may or may not be ideal for use on an expensive and flexible glider canopy. I don't recommend using similar devices in gliders because they "dimple" the canopy when in use and may cause crazing over time. I recommend using the Oudie's cradle with the Richter Cradle Adapter and a RAM arm or GNeck2 gooseneck or RAM suction cup mount. Details are shown below. I recommend rotating the Oudie screen 180 degrees so the power/data cable connects to the top of the Oudie. That gets it out of the way so it can't be bumped by your leg in flight. To rotate the screen, in SeeYou Mobile on the Oudie, go to Menu > Settings > User Interface (UI) and select screen orientation 90 at the top of the screen. the change takes effect when you exit (saving your changes) and re-start SeeYou Mobile. A full Oudie 2 manual is available on the Naviter web site at www.naviter.com - then go to the Products menu and select Oudie 2. Note: See also the Naviter-Oudie-IGC-Bundle below. It includes the Oudie IGC, SeeYou Mobile for use in flight and SeeYou for the PC for viewing and analyzing your flight at home. You save $35 when you order them together. The Oudie IGC is a Personal Gliding Assistant with built-in aviation grade GPS, IGC approved flight recorder, 12 hour battery, audio variometer (not Total Energy compensated) and SeeYou Mobile and ConnectMe software pre-installed. The Oudie comes ready-to-fly with airports, airspace and maps for most of the world pre-installed. 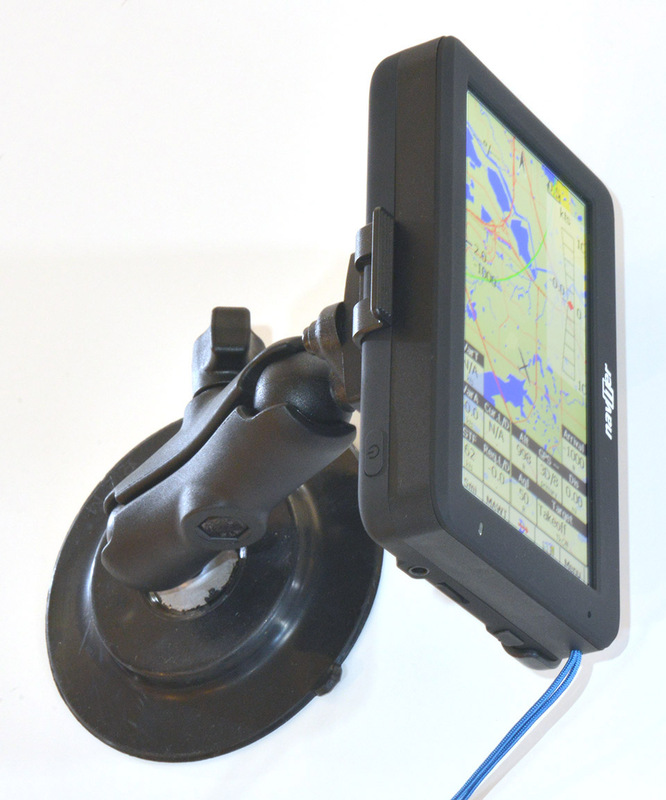 A great portable system with the Oudie IGC, and glider canopy suction cup mount is shown above. The Oudie helps you navigate around a soaring task or directly to any waypoint. Landing sites that are within gliding range are highlighted in green on the moving map. 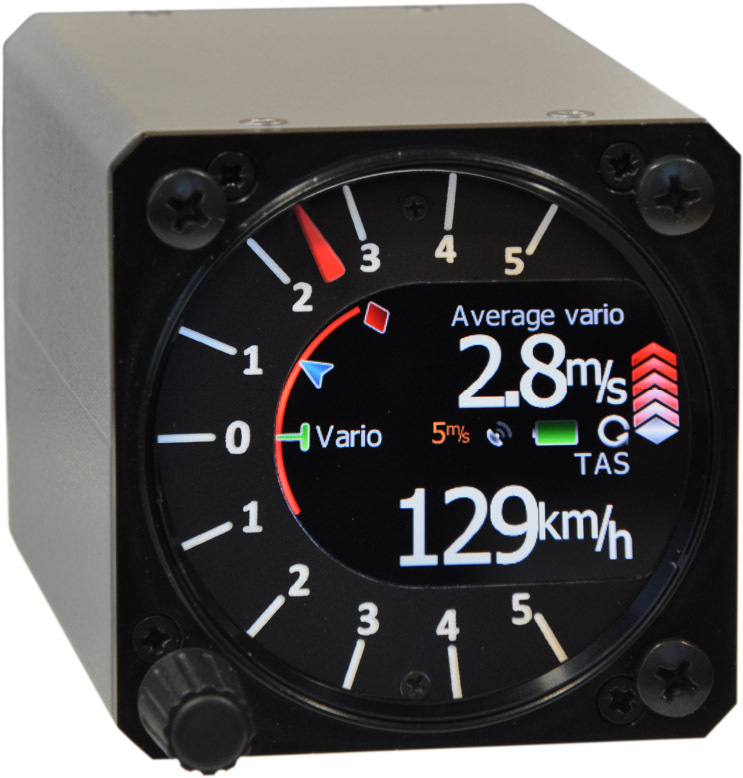 The Oudie calculates wind speed and direction while circling in thermals and can display arrival altitudes at nearby airports or landing sites. The large built-in battery makes it the ultimate portable soaring flight computer to take with you in rental or club gliders. Over 5000 Oudie units have been sold around the world since it was introduced a few years ago - so it is likely you'll see several of them at your local gliderport. With the release of SeeYou Mobile 6.0 the Oudie IGC is able to receive vario data and FLARM data from external devices - making it the ultimate Oudie. It works great in your glider - connected to your vario or soaring flight computer. It also works great all by itself when you fly a club or rental glider. 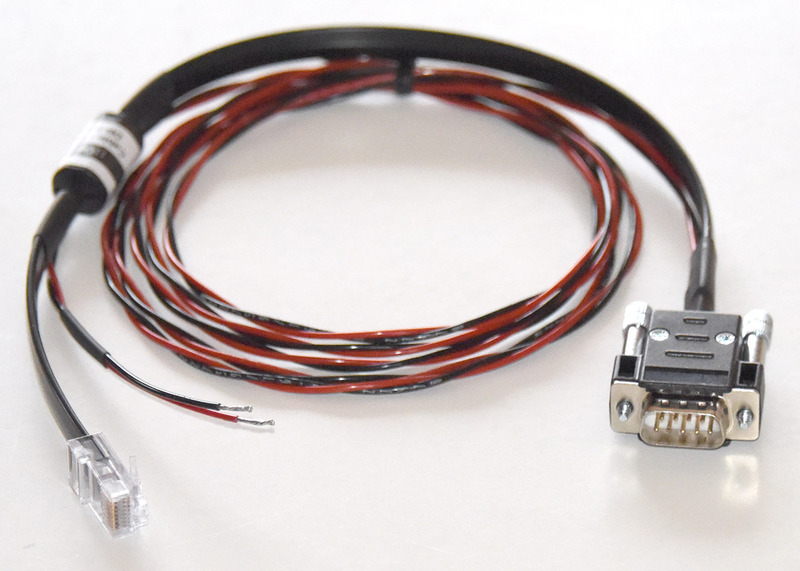 Oudie Cable Kit- It connects to the unit's mini-USB connector and includes a built-in 12V to 5V power converter and an RS-232 voltage level converter. 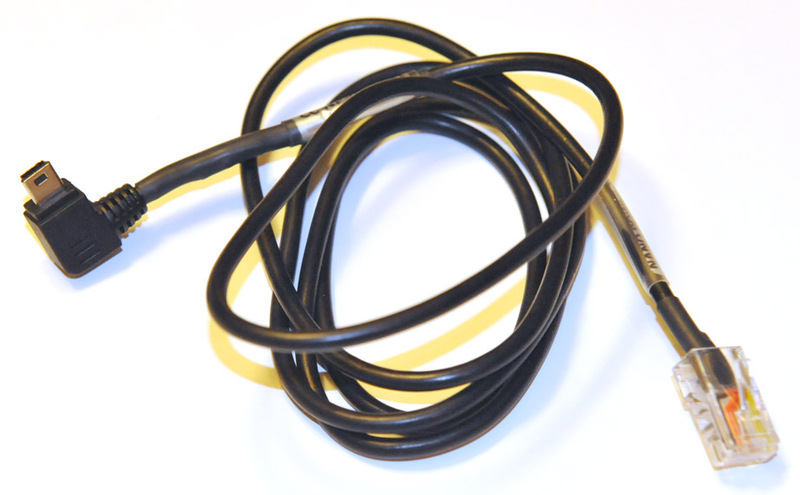 This supplied Oudie cable can be connected directly to a FLARM or PowerFLARM unit. The Oudie IGC has the same bright screen as the Oudie 2 and is supplied with a Lifetime License for SeeYou Mobile. The horizontal and vertical dimensions and screen size are the same on the Oudie IGC and Oudie 2. However, while the Oudie 2 is only thick enough for a battery that lasts about 2 hours, the Oudie IGC is much more thick - accommodating a battery that will run the device for over 12 hours. The larger battery makes the unit much more deep (thick) (25 mm for the Oudie IGC vs. 14 mm for the Oudie 2) and heavier (12.3 ounces for the Oudie IGC vs. 6.4 ounces for the Oudie2). The Oudie IGC also has a built-in pressure sensor which provides a precision altimeter and uncompensated (not Total Energy) variometer. 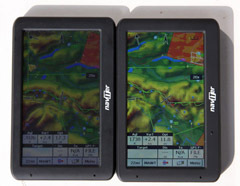 Another benefit the Oudie IGC offers is an aviation grade GPS and an IGC Approved GPS flight recorder. The Oudie 2's GPS is setup for use in a car and the GPS does some smoothing to the position and path which make it a little less precise in the air. 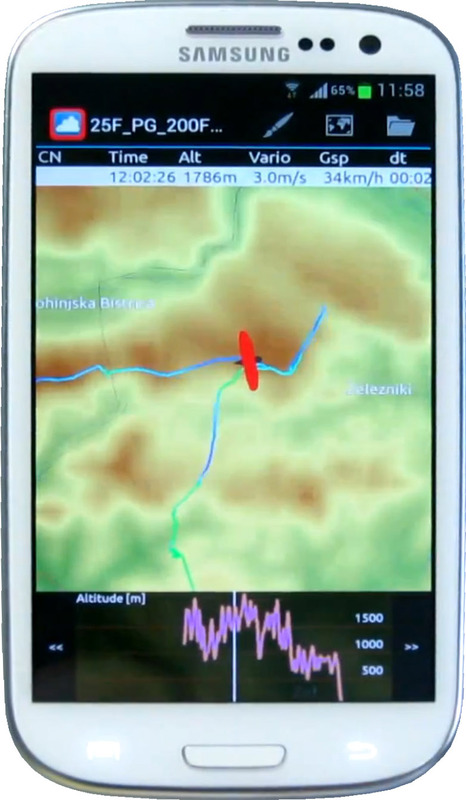 That said, many, many Oudie 2 users have found its built-in GPS to be fine for soaring. I suspect that the Oudie IGC's GPS will allow the unit to calculate wind speed and direction more precisely than the Oudie 2's GPS. The Oudie 2 and Oudie IGC are supplied with the same accessories. The Oudie 2 has been used quite often with an external battery and LXNAV Nano flight recorder. The Oudie IGC combines all those items into a single, compact device. The task that is entered into the Task screen is declared into the Oudie IGC's built-in GPS flight recorder at take-off. Note: The Oudie IGC cannot receive data from Condor soaring flight simulator software. Does the Oudie IGC replace the Oudie 2? Not necessarily - Customers that can power the Oudie 2 with 12V from the glider battery and receive GPS data from a soaring flight computer will be very happy with the Oudie 2. it is significantly smaller and lighter than the Oudie IGC. The Oudie IGC will be popular with customers that would have needed to use an external battery with the Oudie 2 while flying in club or rental gliders. The Oudie IGC does everything the Oudie 2 does - and more. It works great in your glider - connected to your vario or soaring flight computer. It also works great all by itself when you fly a club or rental glider. The Oudie IGC has a built-in pressure transducer which is the precision source for the unit's variometer and altimeter. As you can see in the video below, the variometer is very sensitive. Sailplane pilots may or may not find it useful - since it cannot be connected to a Total Energy probe it is not TE compensated and will show "stick thermals" (climb when you pull back on the stick to slow down and sink when you push forward on the stick to speed-up). Sailplane pilot will find it to be a great backup variometer - the Oudie IGC's large battery assures that it will be ready if you need it. That said, many glider pilots learned to fly without TE compensated variometers. A non-TE compensated variometer works fine as long as you keep the airspeed relatively constant. When connected to an external vario, the Thermal Assistant uses the vario data from the external vario - which is great. 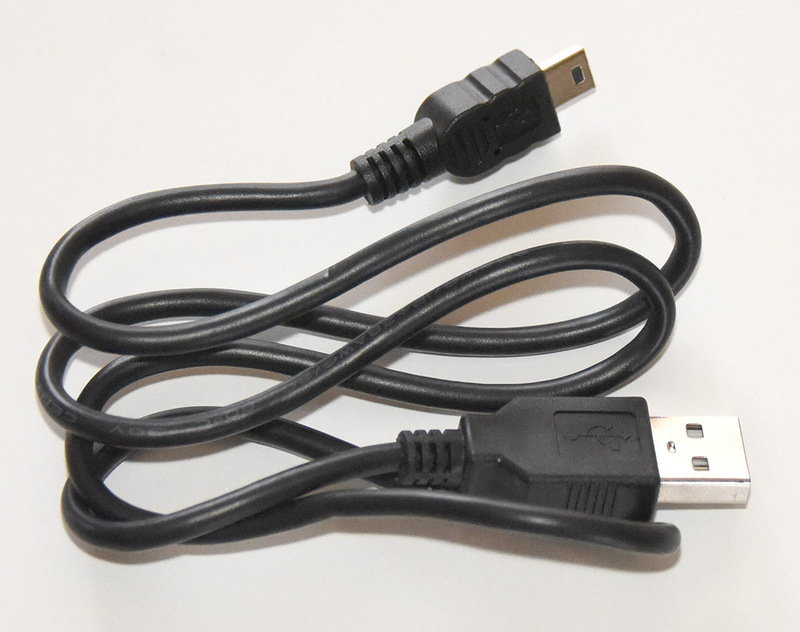 For connecting the Oudie to a PC or 5V battery pack, This is a standard USB to mini-USB cable. If you lose it you can buy another at Radio Shack or Best Buy or Target, etc. Memory Expansion: microSD card, It accepts either standard or high-density (greater than 2 GB) cards . It also has 8 GB or internal memory (of which 2GB will be used by pre-installed world wide vector maps). The remaining memory can be used to store waypoint and airspace files. The Oudie looks like a USB Flash Drive when connected to a PC using a standard USB cable. Therefore, the Mobile Wizard (in SeeYou on the PC) can be used to send waypoint and airspace files directly to the Oudie memory. Answer: The Oudie has a microSD slot, but does not include a microSD card. A customer supplied microSD card may be used to transfer flight logs from the Oudie to your PC and to transfer waypoint and airspace files from the PC to the Oudie. However, and SD card is not necessarily required because you can also transfer data by connecting the Oudie to a PC using a standard USB cable. There is plenty of memory (about 6 GB) in the Oudie which can be used for storing waypoint and airspace files and flight logs. When you connect the Oudie to the PC the Oudie looks like a USB Flash Drive. You can then use Windows File Explorer to transfer the files between the PC and Oudie. However, some pilots (especially pilots in a syndicate in which many pilots use the glider and Oudie) may want to use a microSD card to transfer flight logs home and leave the Oudie at the gliderport. Question: Can I run XCSoar or LX8000 on the Oudie? Answer: Yes. However, I highly recommend SeeYou Mobile. A full Oudie IGC manual is available on the Naviter web site at www.naviter.com - then go to the Products menu and select Oudie IGC. A link to the manual is available on the right side of the screen. This license works with both SeeYou for PC and SeeYou Planner - which runs in any web browser and is accessible at: https://seeyou.cloud/planner. Note: The PC version (downloaded and installed on a PC) is the full version. The online version has limited functionality. Please download the software from the Downloads area above. Your registration key will be e-mailed to you in 0 to 24 hours. Nothing will be shipped to you, so please select "Free Shipping" at checkout. If you want a program CD you must order one below. The overview video below is 1 part of 47 in the SeeYou Training. You can see details on the Training page. This bundle includes a registration key for SeeYou for the PC and an Oudie 2 (with SeeYou Mobile pre-installed) at a reduced price. The reduced price only applies if you buy them both at the same time. You save $35. Please download the software from the Downloads area above. Your SeeYou registration key will be e-mailed to you in 0 to 24 hours. SeeYou Mobile is pre-installed on the Oudie 3. It is assumed that you will download the SeeYou for PC software from the Downloads area above. If you want a program CD for SeeYou for the PC, you must order one below. This bundle includes a registration key for SeeYou for the PC and an Oudie IGC at a reduced price. The reduced price only applies if you buy them both at the same time. You save $35. Please download the software from the Downloads area above. Your SeeYou registration key will be e-mailed to you in 0 to 24 hours. SeeYou Mobile is pre-installed on the Oudie IGC. It is assumed that you will download the SeeYou for PC software from the Downloads area above. If you want a program CD for SeeYou for the PC, you must order one below. Please download the software from the Downloads area above. The Registration Key allows unlimited use of SeeYou Mobile with no time restriction. The License also includes 12 months of free software upgrades for SeeYou Mobile. Your registration key will be e-mailed to you in 0 to 24 hours. Nothing will be shipped to you, so please select "Free Shipping" at checkout. If you want a program CD you must order one below. This option is for customers who purchased an Oudie 2 Lite without a SeeYou Mobile license. The combination of this license together with an Oudie 2 Lite makes an Oudie 2. Oudie, Oudie 2 and Oudie 3 customers do not need to purchase this license because it is already included and entered into the unit. The Registration Key allows unlimited use of SeeYou Mobile on a Naviter Oudie with no time restriction. The License also includes free software upgrades for SeeYou Mobile for the life of the Oudie. Your registration key will be e-mailed to you in 0 to 24 hours. Nothing will be shipped to you, so please select "Free Shipping" at checkout. Please download the software from the Downloads area above. This bundle includes registration keys for both SeeYou and SeeYou Mobile at a reduced price. The reduced price only applies if you buy them both at the same time. You save $35. Please download the software from the Downloads area above. Your registration keys will be e-mailed to you in 0 to 24 hours. Nothing will be shipped to you, so please select "Free Shipping" at checkout. If you want a program CD you must order one below. 1 year of full access to the SeeYou Cloud - which links all the items above together very nicely. Upload your flights to the SeeYou Cloud and access them from your PC or Android device or iPhone or iPad. If you are a registered SeeYou owner already, this is your option for upgrading to the latest version. You will need to enter your serial number during the order process. Don't order this if you have not previously purchased a SeeYou license. Please download the software from the Downloads area above. Your new registration key will be e-mailed to you in 0 to 24 hours. Nothing will be shipped to you, so please select "Free Shipping" at checkout. If you want a program CD you must order one below. Naviter has introduced a new subscription plan for their products. In the past, users of SeeYou and SeeYou Mobile could buy upgrades for $83 U.S. (each) which would entitle them to free upgrades for 1 year. The new subscription plan costs $59 U.S./year and entitles customers with SeeYou and/or SeeYou Mobile licenses to use the full-featured versions of SeeYou for Android and iPhone and iPad and also gets you free upgrades for both SeeYou (for PC) and SeeYou Mobile (for PDAs and PNAs) for the year. Of course, only customers that have purchased licenses for SeeYou can upgrade their copy of SeeYou using the subscription plan. Likewise, only customers that have purchased licenses for SeeYou Mobile can upgrade their copy of SeeYou Mobile using the subscription plan. The new SeeYou subscription also enables full use of the SeeYou Cloud - for sharing your flight logs between devices online. Customers using an Oudie that was delivered with a SeeYou Mobile Lifetime license are entitled to free upgrades for the life of the Oudie. By far the most common reason for repairing an Oudie this year was a broken screen. Oudies were either dropped from altitude to concrete or squashed by the weight of a pilot who did not expect the Oudie to be where it was. 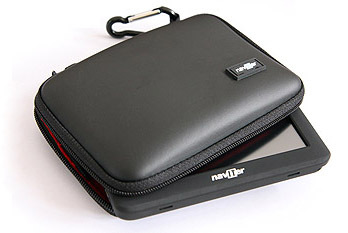 Naviter has therefore set out and designed a tough carry case for your Oudie. It is made out of tough rubber-like material which is there to protect the screen. It also includes a carabiner for easy attachment to your pilot bag in order to keep it at the top of the bag rather than down below. A nice, classy touch is the inclusion of the Naviter logo - to help you remember which of your toys is stored inside. It works great with Oudie, Oudie 2, Oudie IGC, and Oudie 3 (for paragliders and handgliders) units. Note: The case also works great with an iPAQ hx4700 or just about any other PDA or PNA. This cradle shipped with Oudies in the past. New Oudie's use the new "Richter" version below. 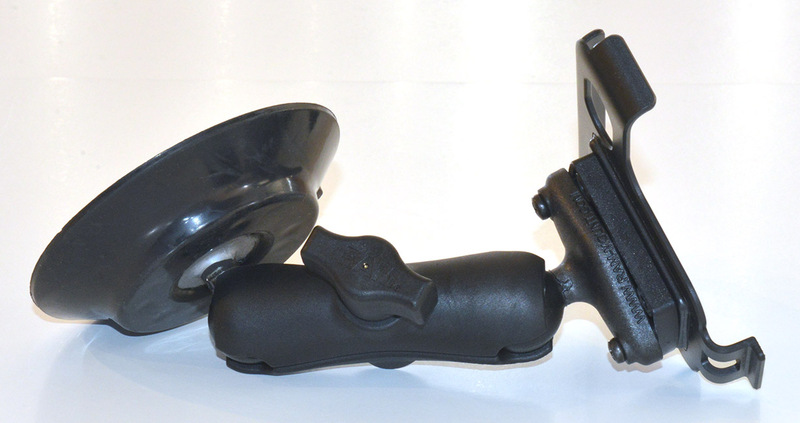 It is designed for use with the suction cup that is included with previous versions of the Oudie. 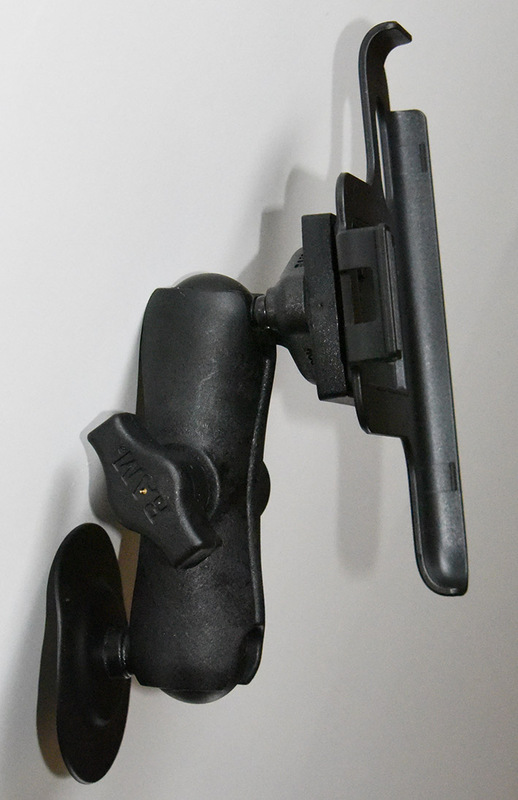 It does not work with the Richter-Cradle-Adapter or with the suction cup mounts that are supplied with Oudie 2 or Oudie IGC units. It works with Oudie, Oudie 2 and Oudie IGC units. This cradle is provided in the box with Oudie 2 and Oudie IGC units. 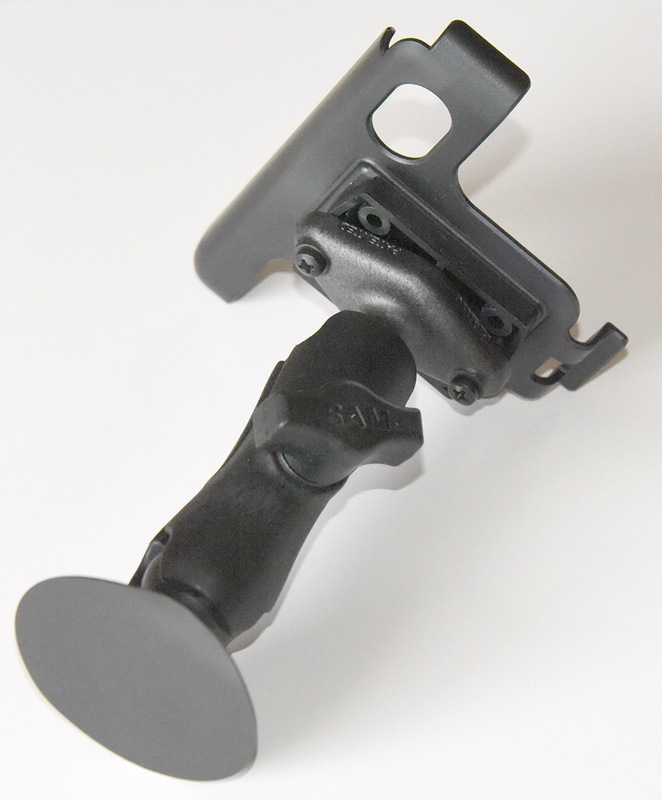 It is designed for use with the suction cup that is included with the Oudie 2 and Oudie IGC. 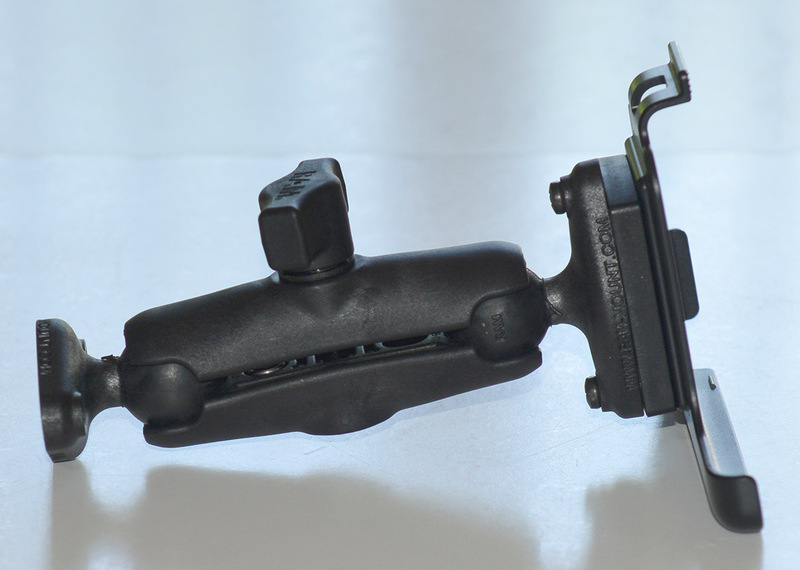 It works great with the Richter-Cradle-Adapter for easy mounting to any RAM diamond base or RAM-GN3-238 gooseneck adapter. It works with Oudie, Oudie 2 and Oudie IGC units. 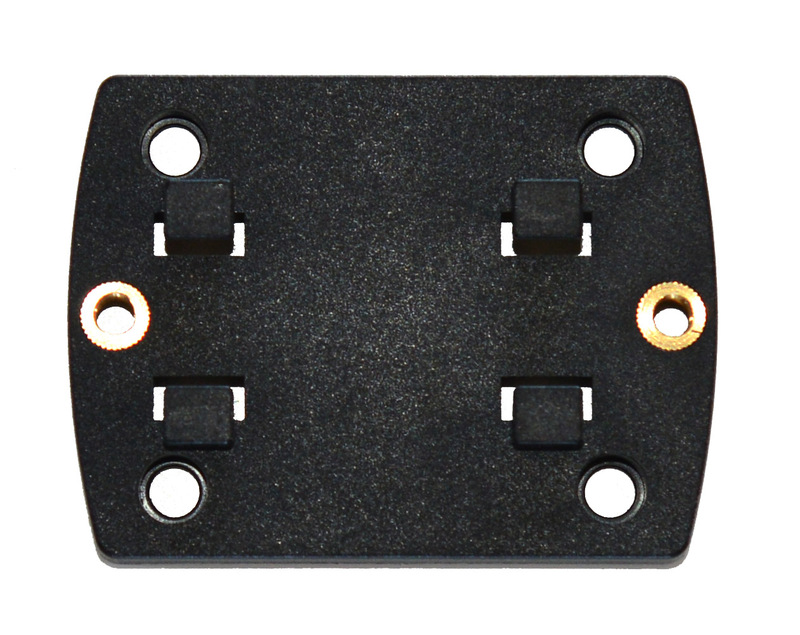 This adapter is used to mount an Oudie cradle on a RAM diamond base or RAM-GN3-238 gooseneck adapter. 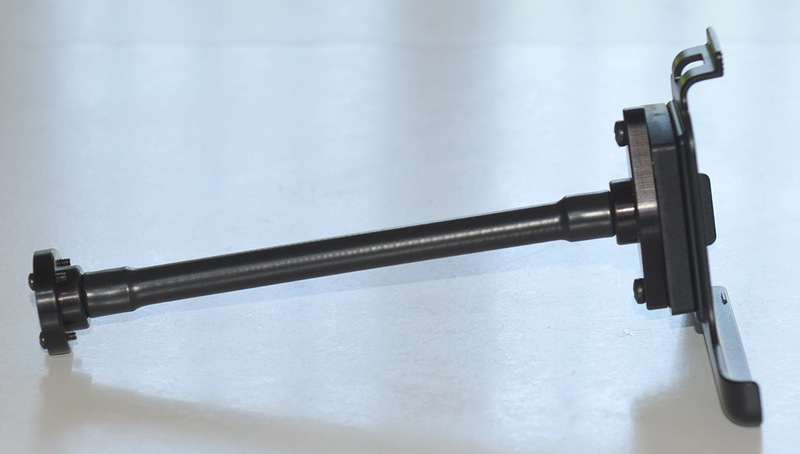 It is provided with M4 x 16 screws for connection to a RAP-B-238U diamond base or M4 x 12 screws for connection to a RAM-B-238U or RAM-GN3-238 gooseneck adapter. This is a great way to mount your Oudie, Oudie 2 or Oudie IGC to your glider's instrument panel or cockpit sidewall. This is a great way to mount your Oudie, Oudie 2 or Oudie IGC to your glider canopy. Unlike suctions cup mounts that have a clamping or locking action, this simple and reliable 4" diameter rubber suction cup will not damage your glider canopy. Be sure to clean the canopy and suction cup and wet the suction cup to assure a secure application. This is a great way to mount your Oudie, Oudie 2 or Oudie IGC to a flat, smooth surface in your glider. The round base is somewhat flexible - so it can conform to surfaces that are slightly curved. A round adhesive disc is included along with an alcohol wipe for cleaning the mounting surface. Note: A single RAM-202PSAU adhesive discs is included. You may want to order a few extras for future use. Remove the plastic from one side of the adhesive disc and apply it to the RAP-B-378U base. Remove the plastic from the other side of the adhesive disc and press the base firmly onto the mounting surface for about 1 minute. Wait 24 hours before mounting the arm and Oudie on the base. This allows the adhesive to setup. 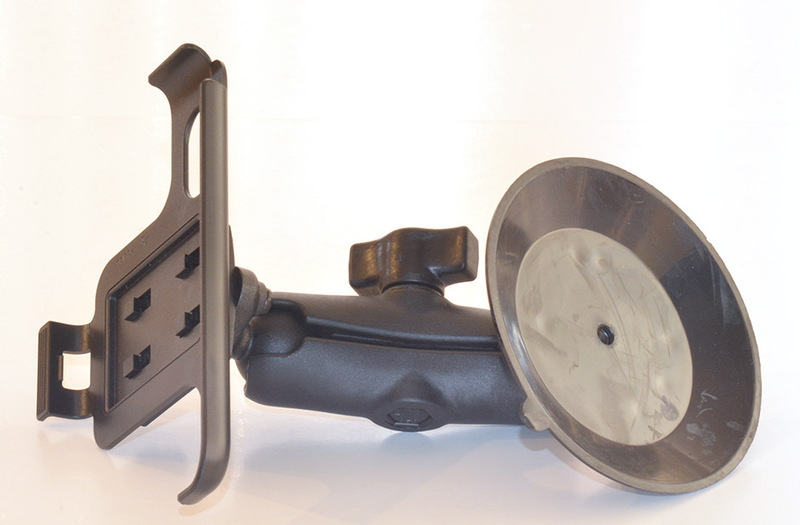 This is a great way to mount your Oudie, Oudie 2 or Oudie IGC to your glider's instrument panel. It is more elegant than a RAM arm, but more expensive and not quite as rugged, secure and reliable. This is a great way to mount your Oudie, Oudie 2 or Oudie IGC to your glider's cockpit side-wall, or to the side of the instrument panel cover. It is more elegant than a RAM arm, but more expensive and not quite as rugged, secure and reliable. 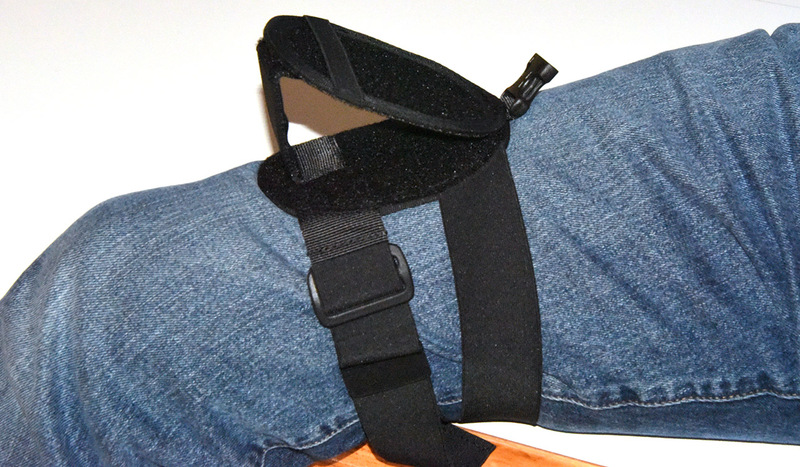 This is a good way to mount your Oudie, Oudie 2 or Oudie IGC to your thigh. It is less elegant than a RAM arm or gooseneck arm, but it is inexpensive and portable. It is great for use in rental or club gliders. Velcro strips (with hooks) are not included for attaching to the back of the Oudie or Oudie cradle. 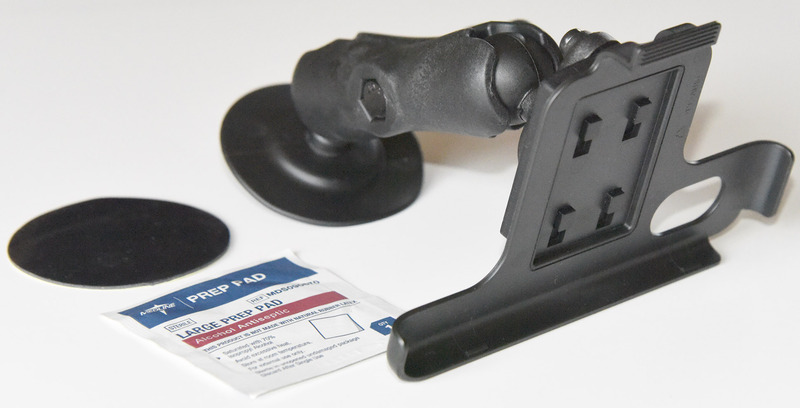 The mounting surface has the soft Velcro surface built-in. 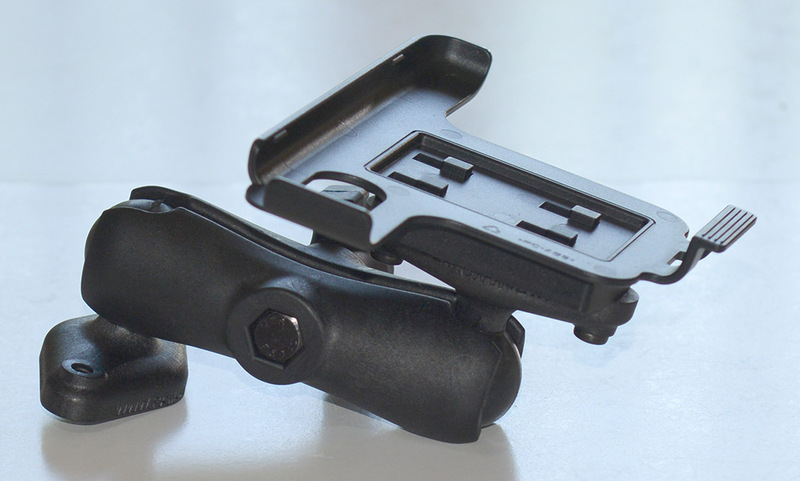 The mounting surface is angled and slightly adjustable to allow for easy viewing in flight. The long strap with the loop at the end can be used by running your belt through it - to keep it from sliding down when standing. It is attached with a snap connector so it is easy to remove if you don't want to use that feature. This is the 2nd generation Oudie cable kit. It is included in the box with the Oudie. It must be powered with 12V. The cable includes a circuit board with 12V to 5V power converter for powering the Oudie with 5V. It also includes an RS-232 signal level converter. It can also power the connected soaring instrument with 12V. Includes: 12 V power leads, mini-USB connector for Oudie, and RJ45 connector. 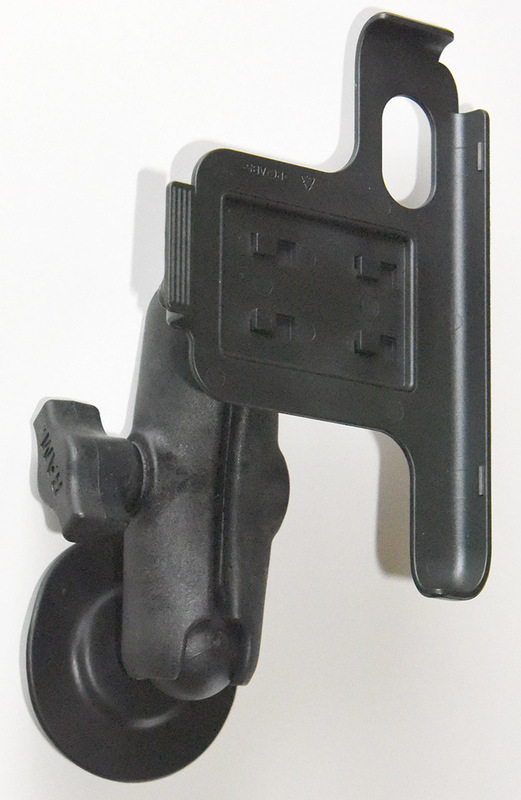 The RJ45 connector can be connected directly to a FLARM or PowerFLARM unit or Volkslogger. This cable will provide the 12V power to the FLARM, PowerFLARM or Volkslogger. The pins connections are to the "IGC Standard" - which is documented in the PowerFLARM Core Manual here: https://flarm.com/support/manuals-documents/. As you look at the end of the RJ45 connector with the cable going away from you and the tab up, pin 1 is on the right and pin 8 is on the left. Important Note: Make sure the unused wires cannot short together. Cutting them off is not good enough. I recommend putting shrink tubing over the connectors on the unused pins. That way they can't short and will be available for future use. Note: The 12V power leads on the cable must be powered. The 5V power from the 302 or GPS-NAV is not used. Note: The Oudie power/data cable's RJ45 connector can be connected directly to the PowerFLARM Core. However, the RJ45 port will probably used for connection to the remote FLARM display. Note: The 12V power leads on the Oudie power/data cable must be powered. Note: The 12V power leads on the cable must be powered. The 5V power from the LX160si or LX1600 or LX7007 is not used. Note: The 12V power leads on the cable must be powered. 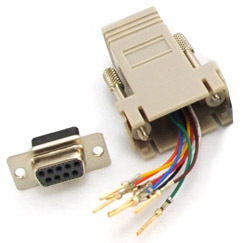 Most current PCs don't have an RS-232 port, so a USB to serial adapter is required. I highly recommend the FTDI Chip USB Serial Adapter. Most others I've tried don't work. Note: The Oudie also has a built-in Bluetooth radio, so it may be possible to connect it to a Bluetooth enabled PC without any cables. Note: The 12V power leads on the cable must be powered. The soaring instrument does not provide 5V power for the Oudie. Note: The 12V power leads on the cable must be powered. 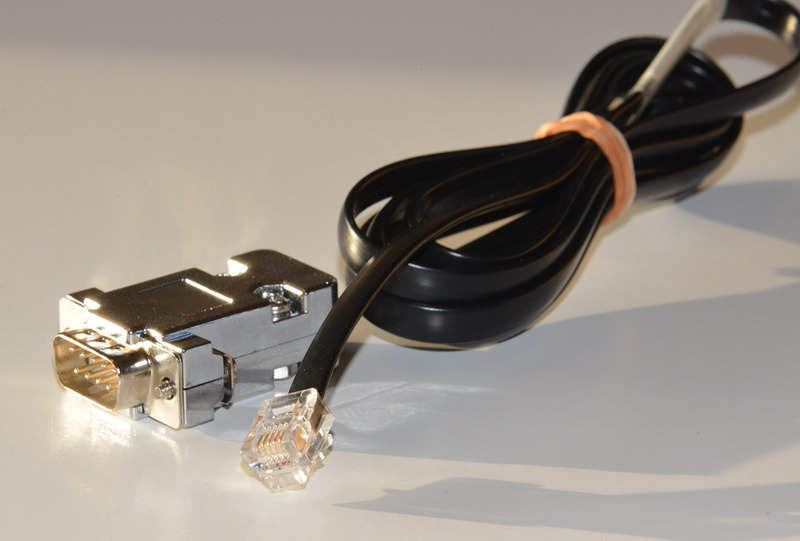 Most current PCs don't have an RS-232 port, so a USB-to-Serial adapter is required. I highly recommend the FTDI Chip USB Serial Adapter. Most others I've tried don't work. 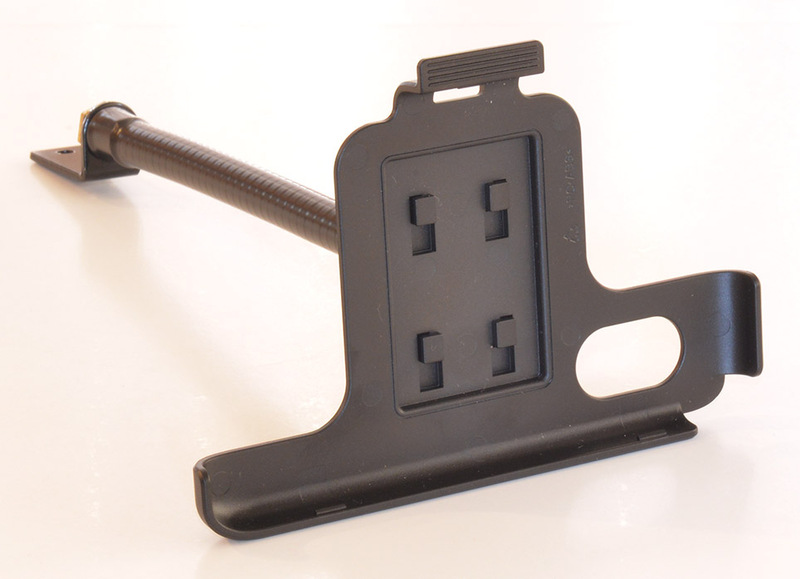 This is a configurable adapter that can be used to connect the Oudie Power/data cable to a variety of soaring instruments. One is included in the box with the Oudie. Simply push the pins into the receptacles on the DB-9m connector and snap the connector into the housing. Female RJ45 connector connects to the Oudie Power/data cable.DB-9m (male) connector for soaring instrument, This adapter can be used to connect the Oudie to a Cambridge GPS-NAV or 302 (see details below). Note: The Oudie power/data cable's RJ45 connector can be connected directly to the PowerFLARM Core. However, the RJ45 port will probably used for connection to the remote FLARM display. This adapter makes it possible to connect to the PowerFLARM Core's DB-9f port. This adapter and he connections below can also be used to connect an LXNAV S7 to the PowerFLARM using an LXNAV S7-GPS-PF cable. These connections make it possible to connect the Oudie power/data cable to an LXNAV LXNAV-LX5PC cable that is connected to the round, 5-pin Binder connector that is on the wiring harness of an LX8000, LX8080 or LX9000. Note: The 12V power leads on the cable must be powered. The cable will not communicate if it is not powered. This is a standard USB to mini-USB cable. It can be used to connect an Oudie or Nano or Nano 3 to a PC. 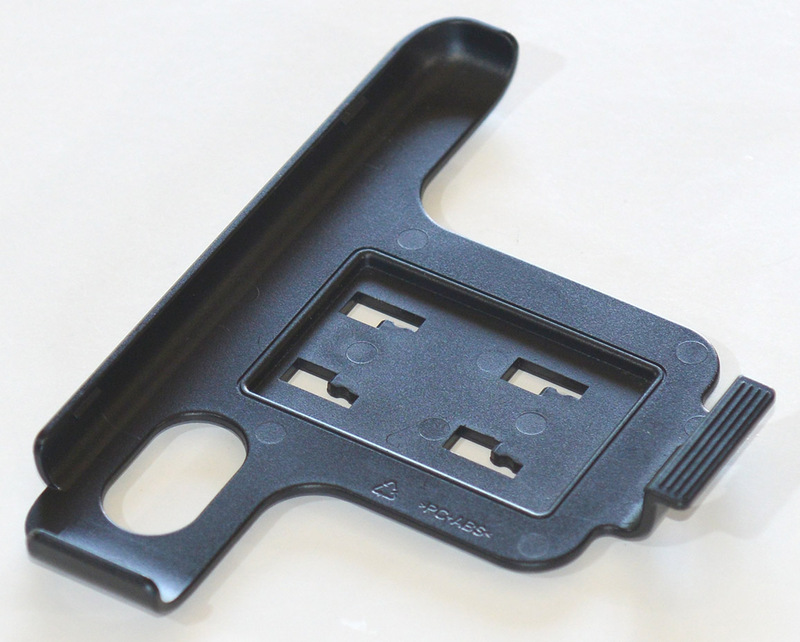 It can also be used to connect a Nano or Nano3 to a NanoPower Adapter or an LXNAV-S7-GPS-Nano cable. One is supplied with Nano, Nano3 and Oudie products. There is nothing specialy about the USB to mini-USB cable. You can get one at Radio Shack, Target, Best Buy, etc. Accelerate your learning curve! Get up-to-speed on your new soaring software or instrument in an hour or 2 - with help from an expert. I offer training over the phone on the soaring software topics listed below for $60/hour. What we cover is up to you. It includes free web conferencing features as described below. I will bill you for the minimum time period of 1 hour ($60) and if we don't use it all I will make a note of the amount of time remaining for you to use in future support calls. 1 hour is usually plenty to get most people on the right track. Phone charges are not an issue as I will call you. After you place the order, please call to schedule a time for the training. The best time for me is usually between 9 AM and 5 PM, or between 9 PM and 11 PM U.S. Central Time, Monday through Friday, but other times can be arranged. "Thank you, Paul, for your marvelous support. Not only is your website a fabulous source of information for glider pilots, but you've been unfailingly responsive to my hardware and software needs. Last but not least, I've gotten much more out of my equipment as a result of our remote-tutoring sessions by cell phone and computer hook-up. Thanks again!" "Now that the soaring season is over, I wanted to thank you for another wonderful year of support from you in connection with my soaring activities. It's been wonderful knowing that you are there to help with technical problems, and I love the opportunity to have remote tutoring sessions with you. Thanks again, very much." If you want to call me for free you can reach me using Skype. It is a free internet phone service that requires only a high-speed internet connection and a microphone and speaker for your computer. You can download it free here: http://www.skype.com. I include free web conferencing with all technical support calls. I use a free service called Join.me. It makes it easy to connect our computers and (with your permission) view your screen. 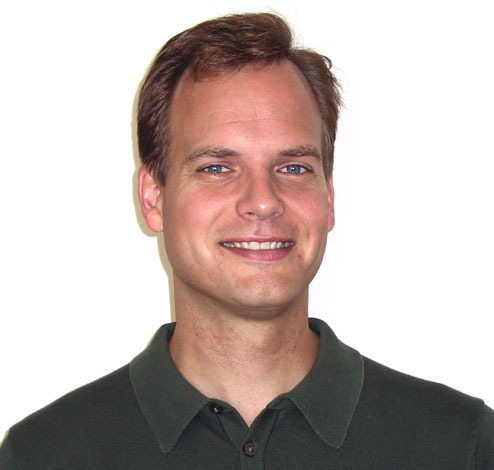 I have been using web conferencing a lot lately for one-on-one training/support sessions. I can talk you though a software download or soaring software feature and you learn from the experience because you do the work while I watch. I can also take control of your machine (only with your permission) to do complex tasks more quickly. The web conferencing is amazing. It is as if I am in the same room with the you, looking over your shoulder (at the PC screen only - no need to comb your hair or get out of your pajamas). There is no need to install software at your end. I use this service during nearly every phone support session I do - several times a week. The list below is a start. I am familiar with many other products as well. I have created training CDs with 3 hours of training on SeeYou for the PC. You can see details on the Training page.